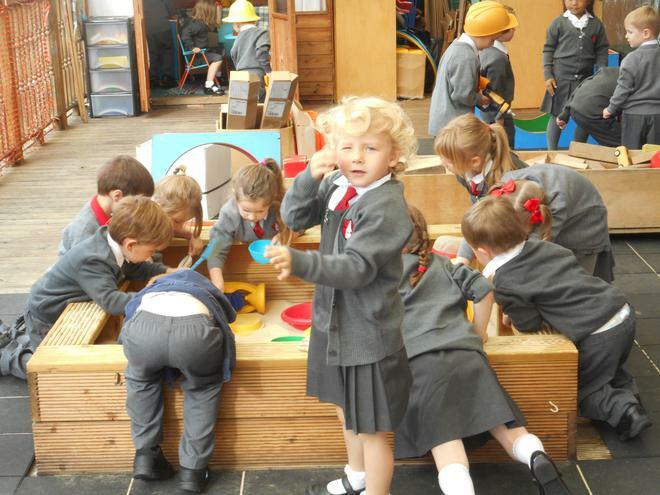 We have a wonderful first term planned, with so many exciting things to do. 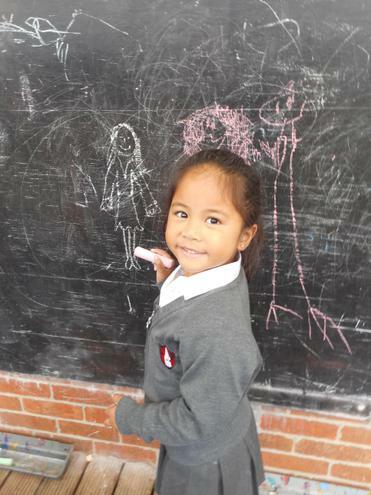 The first, most important job, is to make sure we are all happy and settled, know where everything is, and what we need to do! 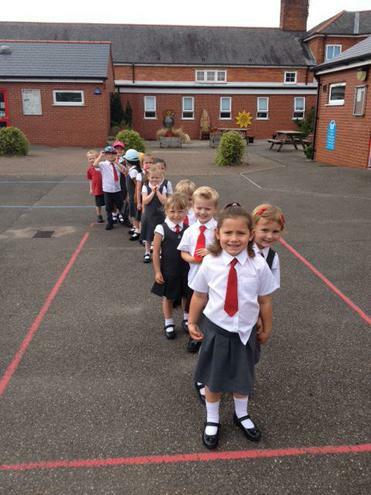 Click below to see our timeline for Terms 1 & 2. 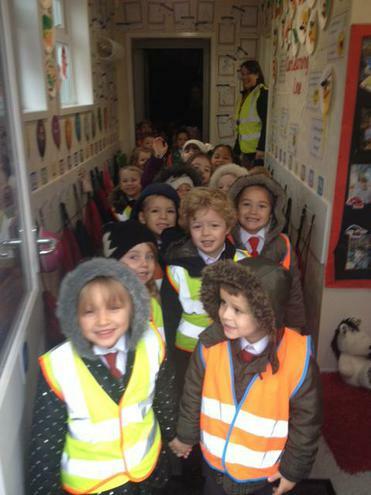 Our fantastic first day at school! 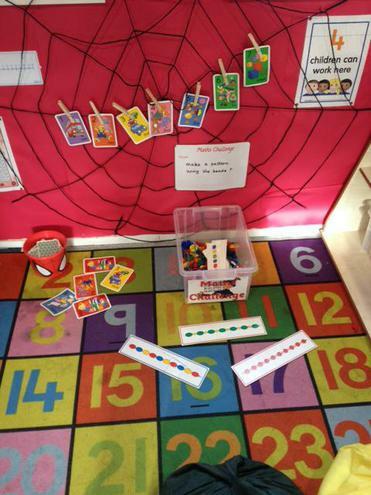 Maths Challenge: which helps consolidate our learning from the previous week and covers everything from shape and pattern to adding numbers! 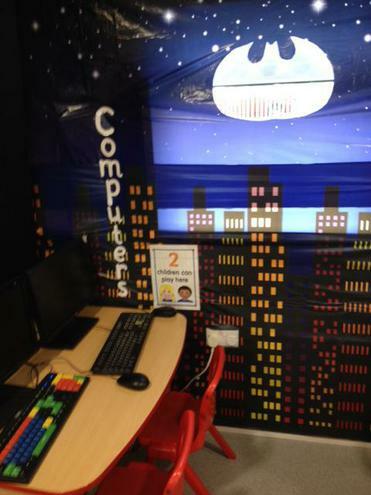 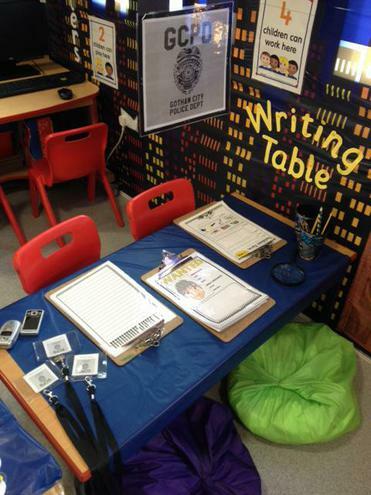 We have had fun creating our own 'Wanted' posters to our Gotham City Police Department Computer and Writing Table area. 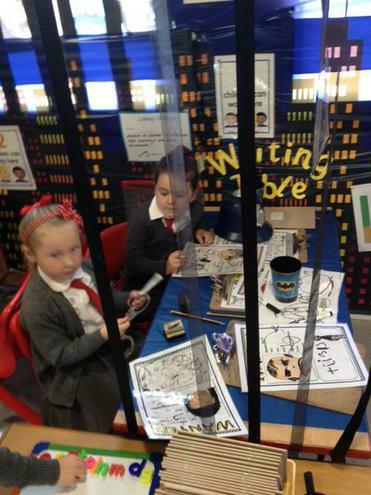 We used felt tip pens to design our own villains! 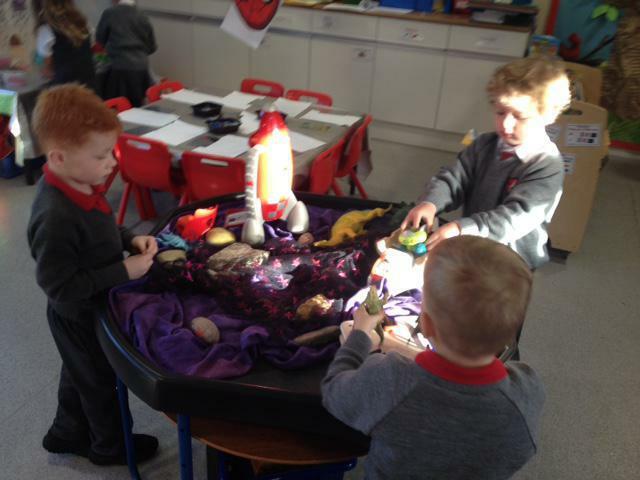 We have been learning about Harvest. 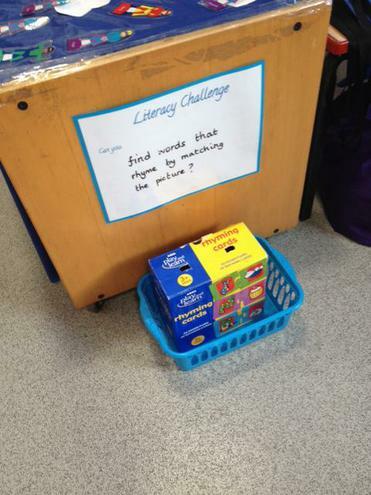 Our chef, our superhero Mrs Jones (who makes our delicious lunches every day), set us a challenge. 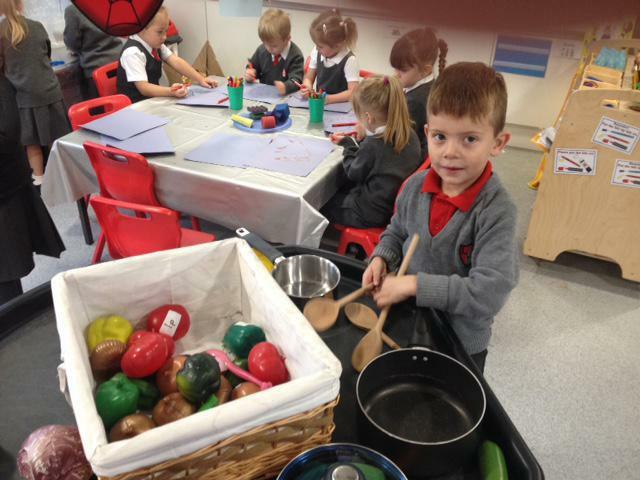 She wanted us to design our own soup - something yummy and healthy. 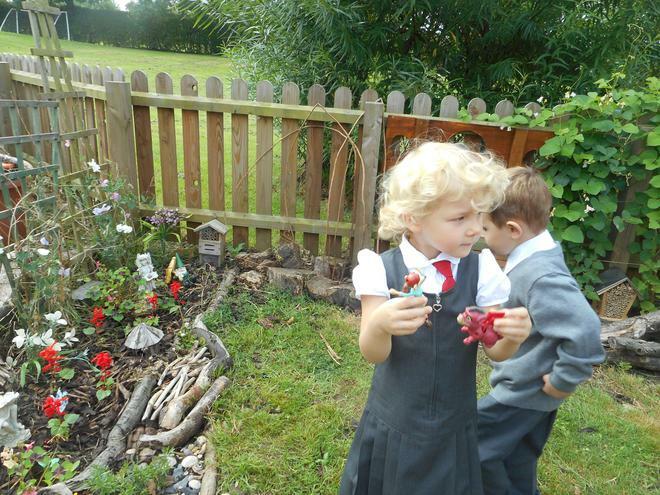 We accepted her challenge and searched our garden where we could lots of vegetables had grown and were ready to eat! 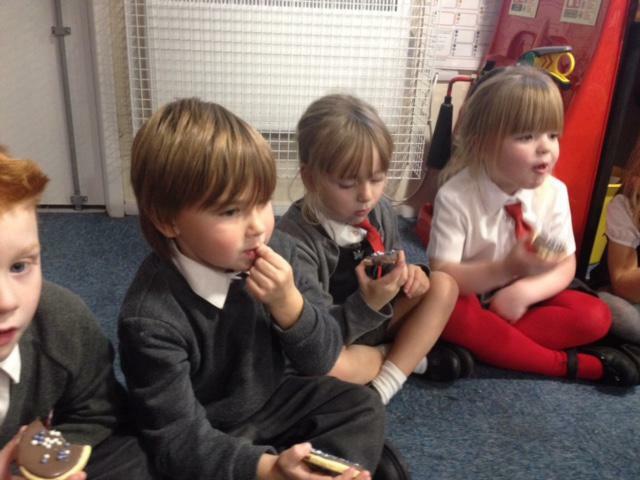 Whilst we were exploring all the delicious vegetables, we decided to use them in other ways too. 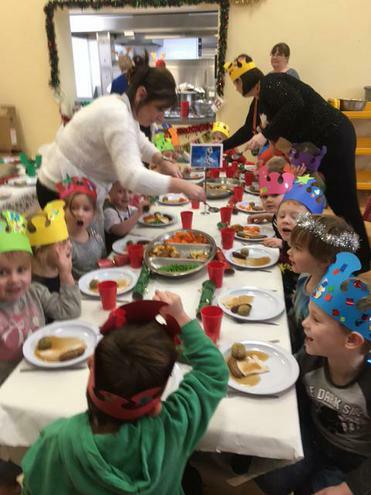 We cut some of them up and used them to print delicious meals. 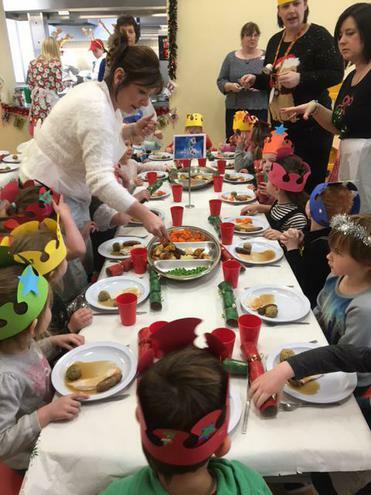 We had to match the correct colour to each vegetable. 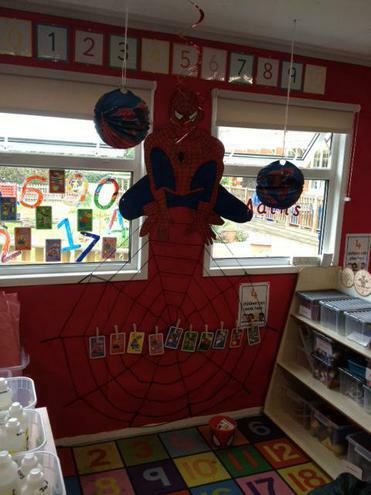 We were so pleased with our meals that our teachers put them up in Spiderman's kitchen for us all to admire! 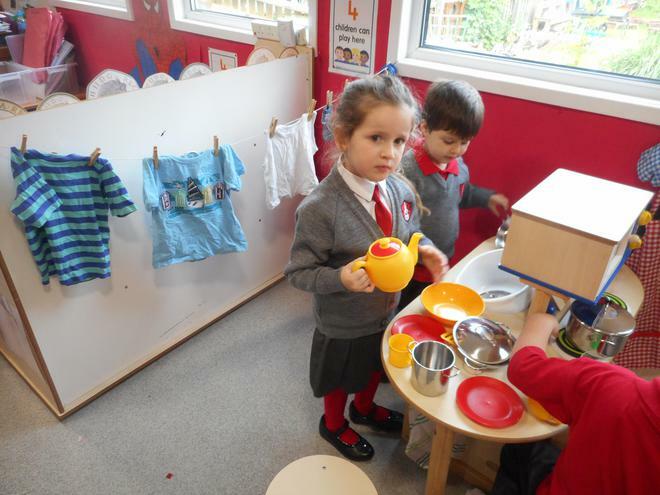 We have been reading the story of Mrs Wishy Washy. 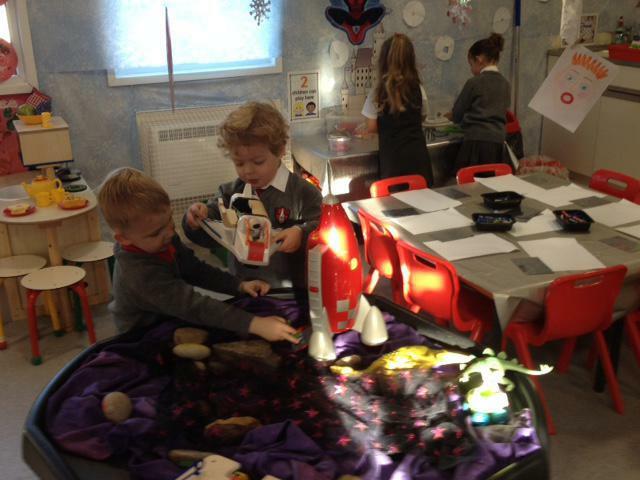 We had great fun providing the sounds of the animals, the actions, and the facial expressions for Mrs Wishy Washy! 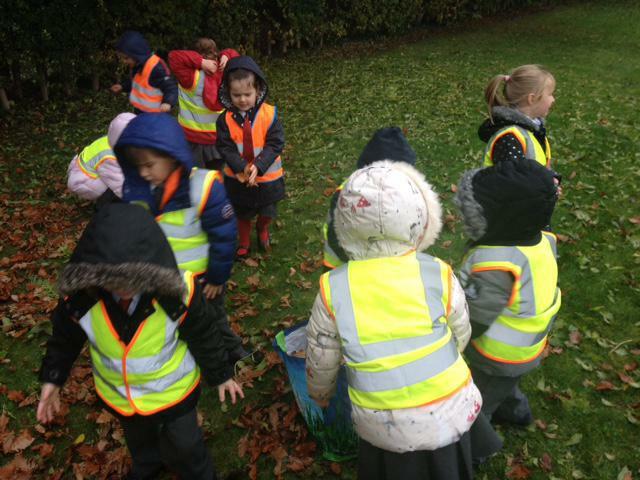 There is always so much to see and explore! 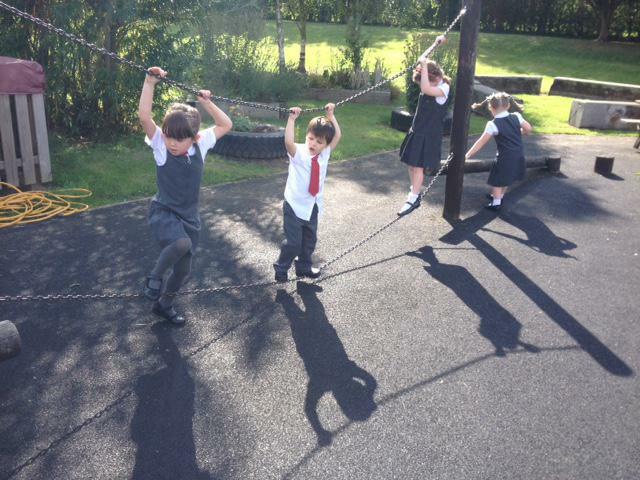 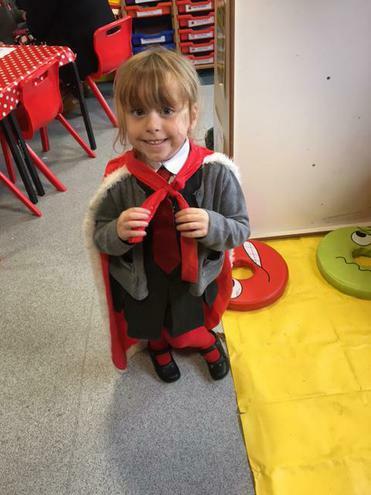 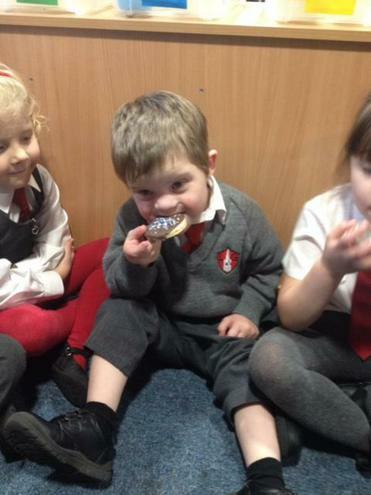 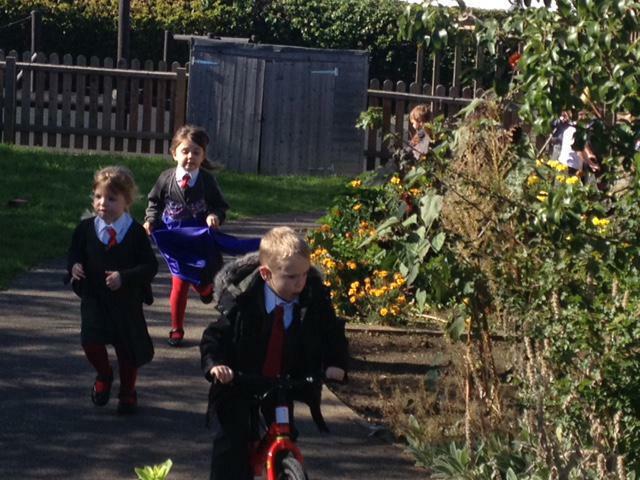 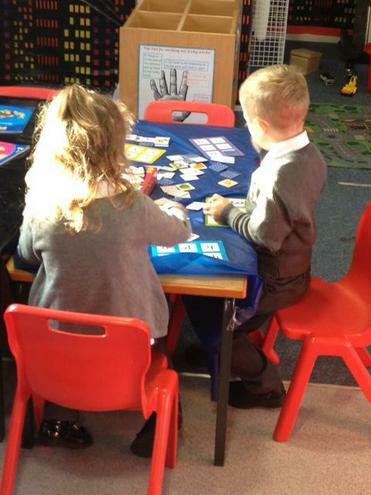 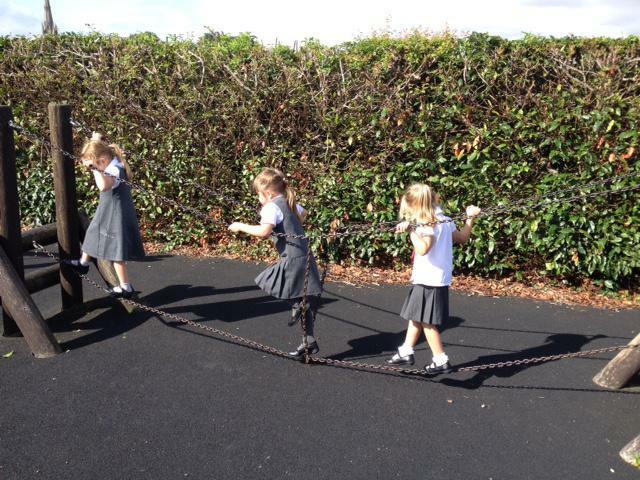 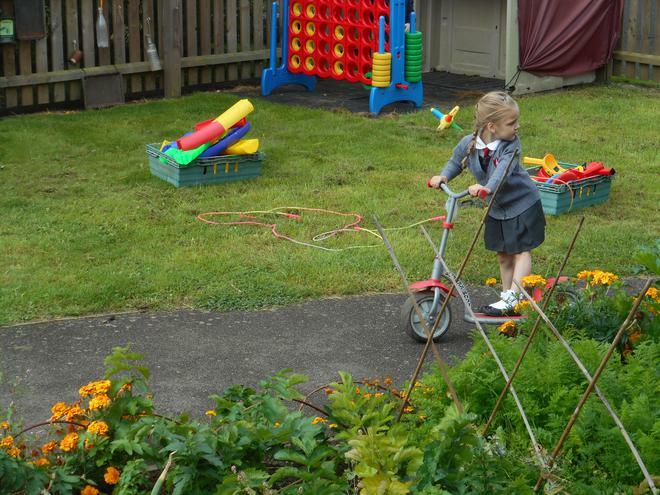 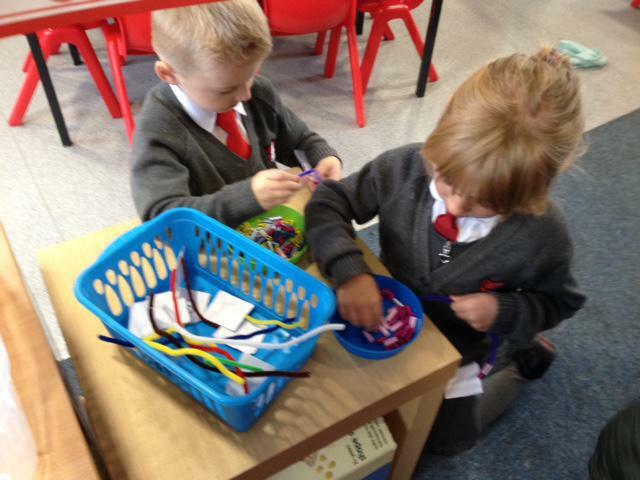 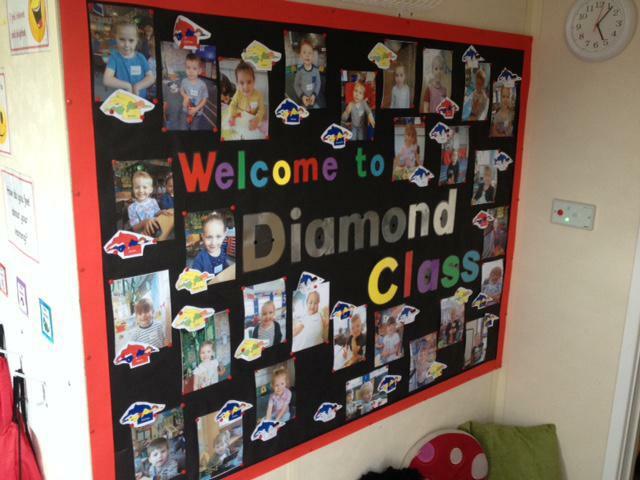 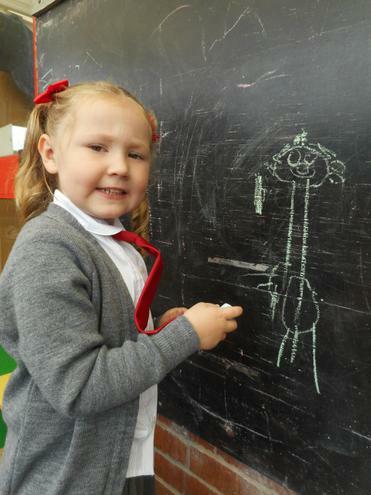 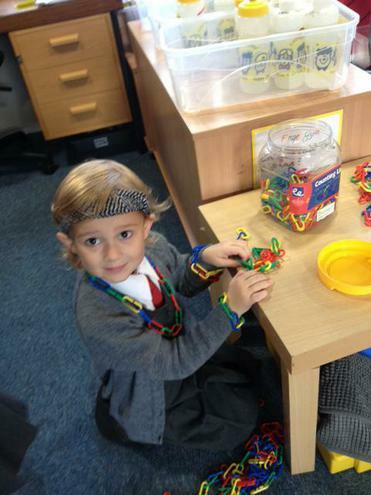 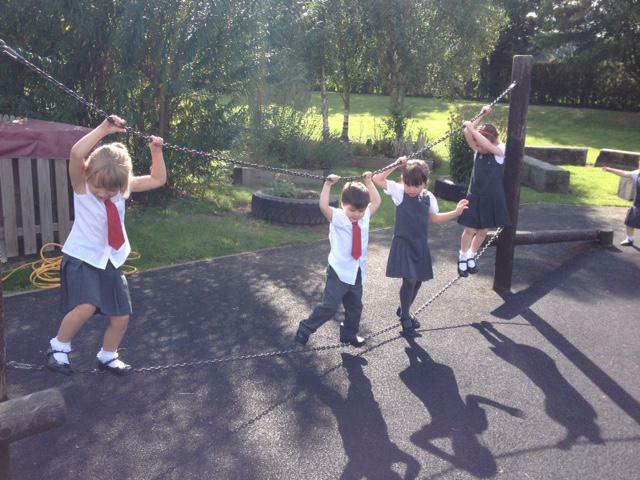 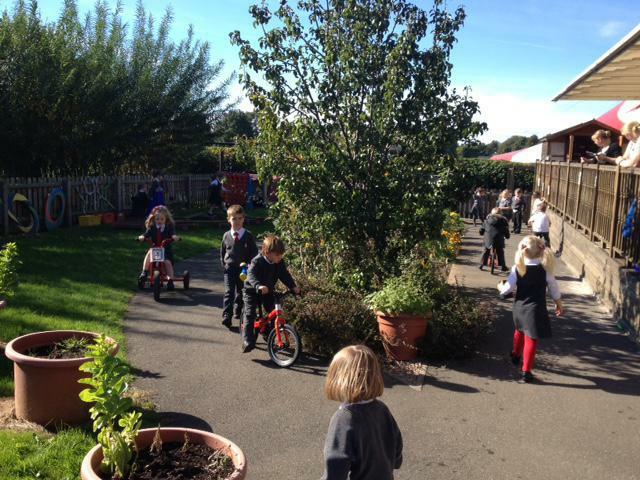 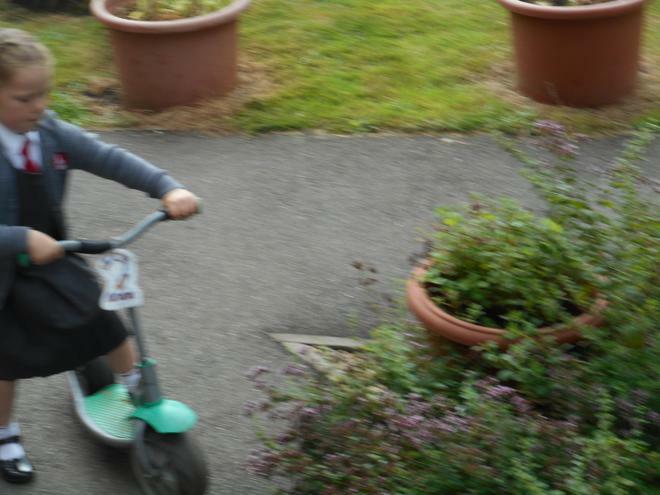 These photos show just some of the things we do when we first get into school in the mornings. 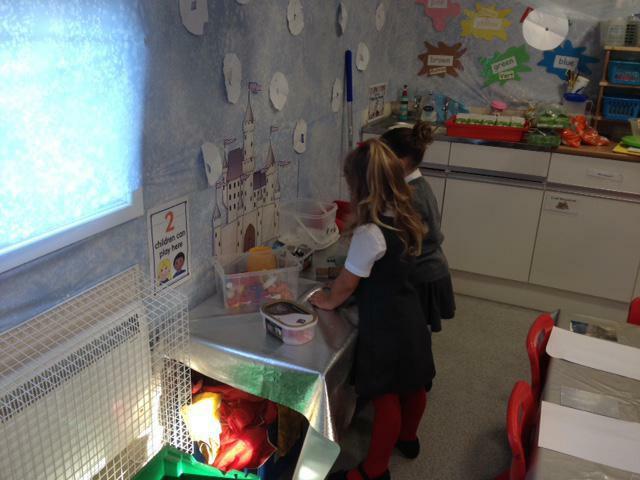 We have settled really well into our classroom. 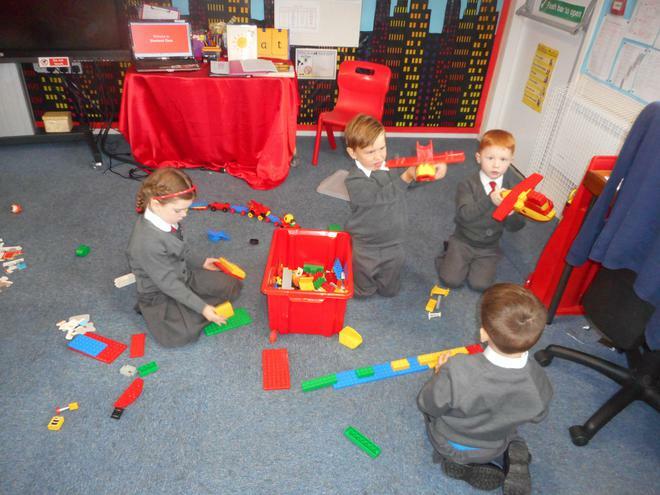 Our teachers are so happy with how we play and work with each other, how we can choose things to do for ourselves, and how we treat our lovely classroom and the things that are in it. 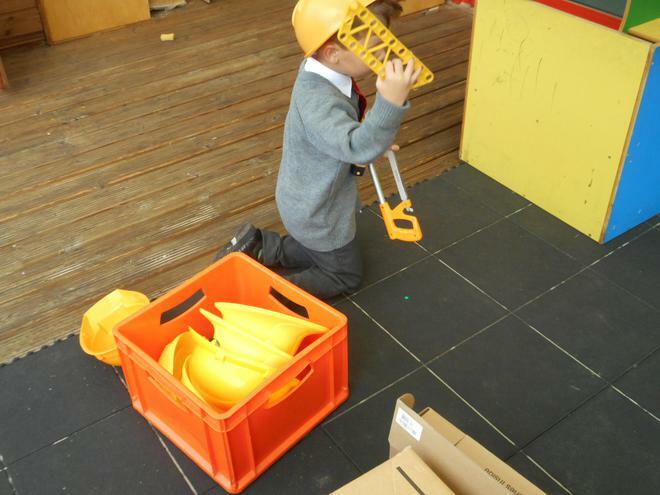 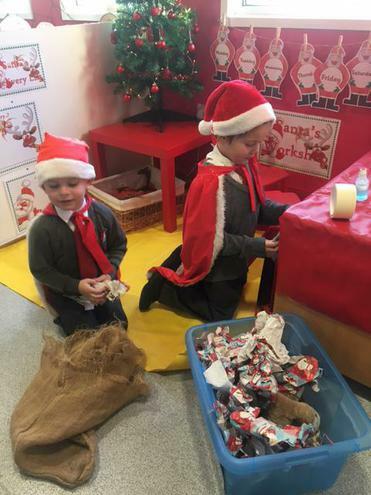 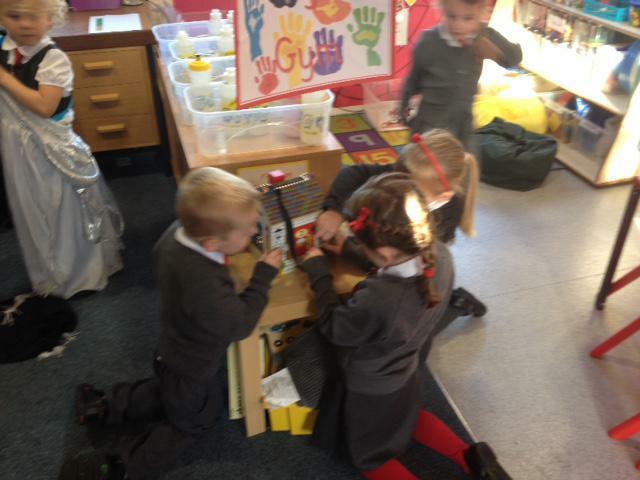 When we hear our special music - we know what to do - it's tidy up time! 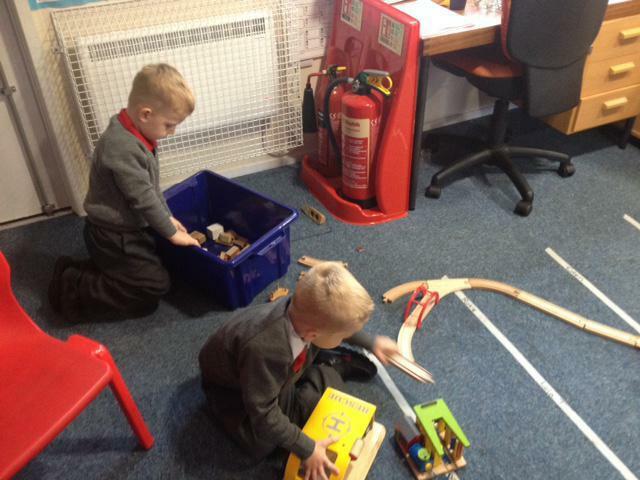 We are super duper are tidying our things away! 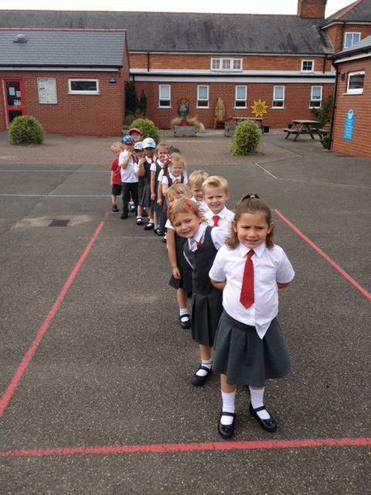 This is so much fun - we laugh so much when we are following this! 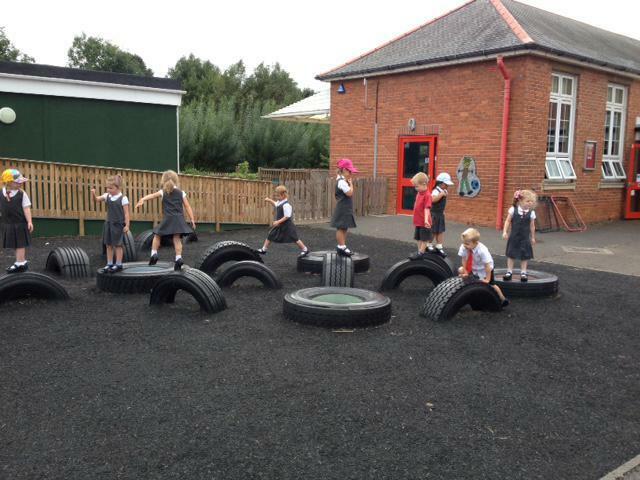 It's a great way for us to move our bodies. 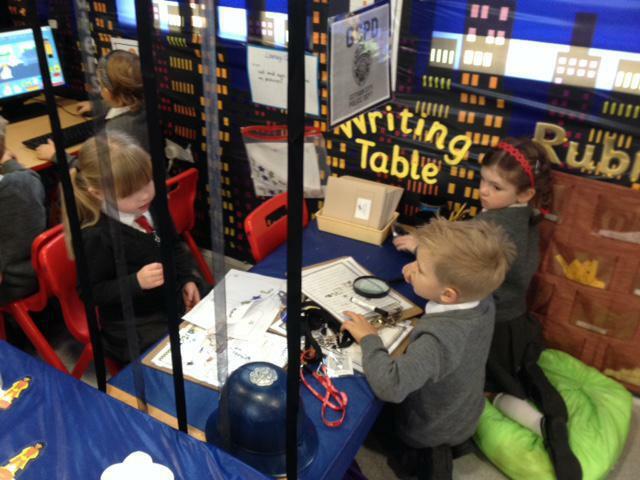 This table always has some books on it linked to our learning. 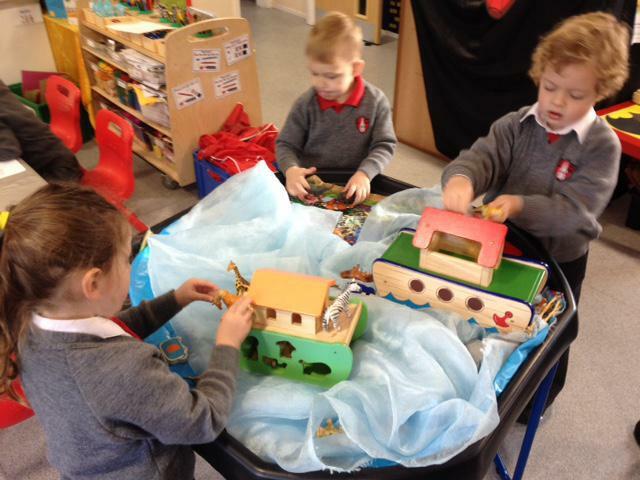 Here it has books all about Harvest, vegetables and farms. 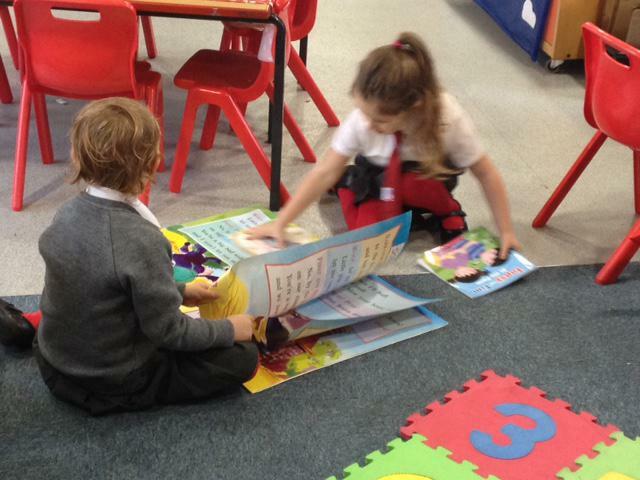 We love books in Diamond Class, and have been enjoying sharing them with our friends. 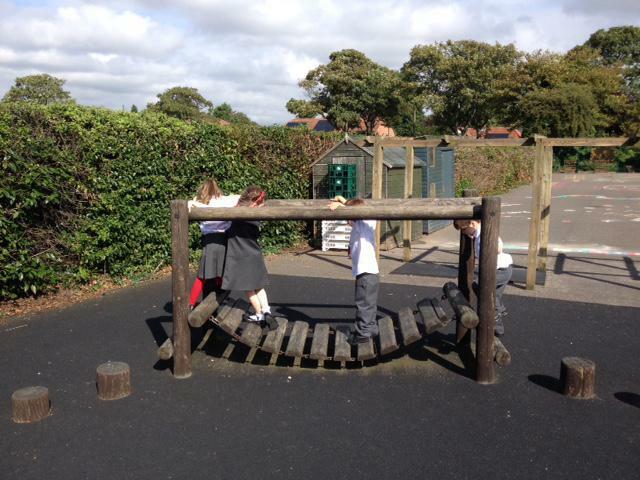 We really enjoy choosing activities to share with our friends! 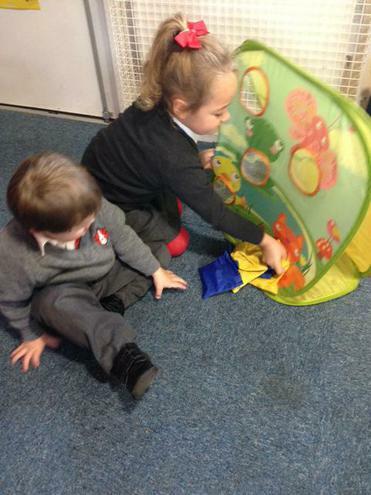 It's nearly Mrs Wishy Washy's birthday and we got her a selection of shapes, as she likes making pictures out of them. 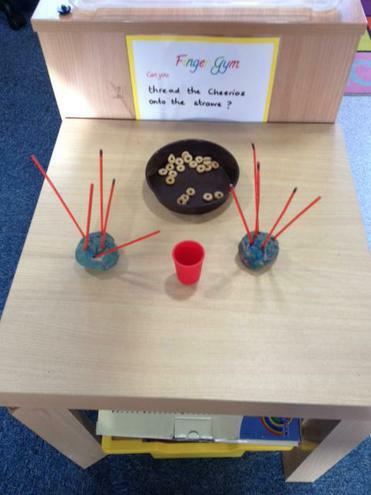 We decided we would try too. 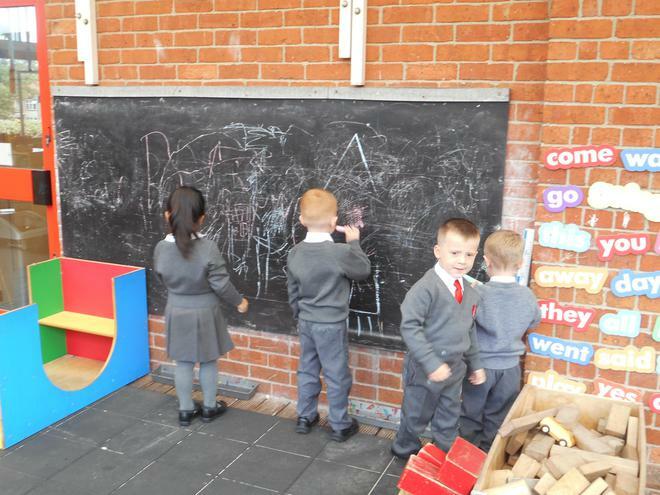 We explored a range of shapes, including diamonds and pentagons, and drew around them to make pictures of Mrs Wishy Washy's house. 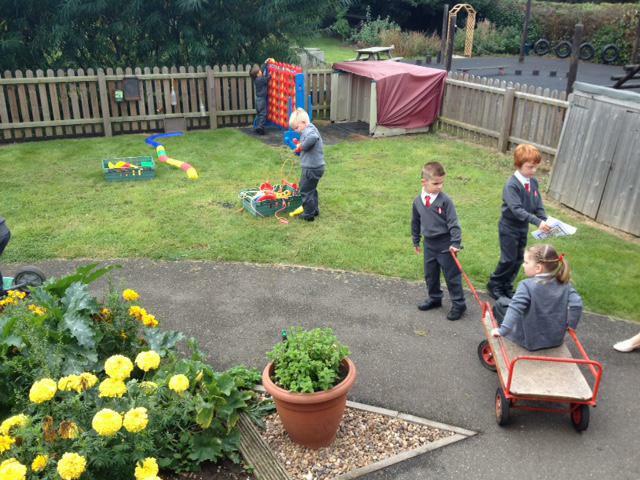 We have been looking at how tractors are used to help harvest the crops. 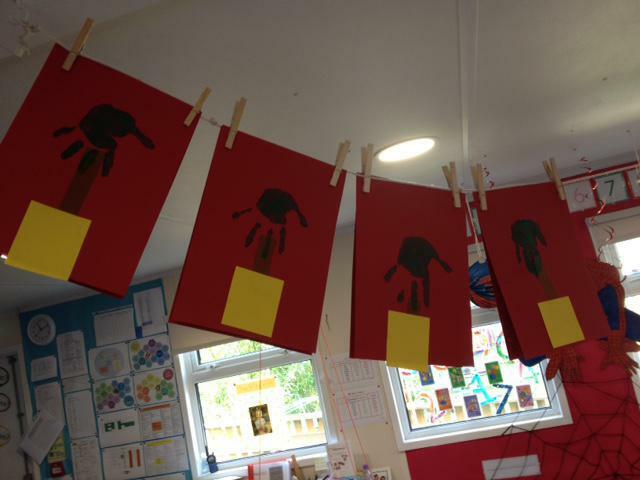 So we have used squares, circles and rectangles of different sizes and colours to make these tractor pictures. 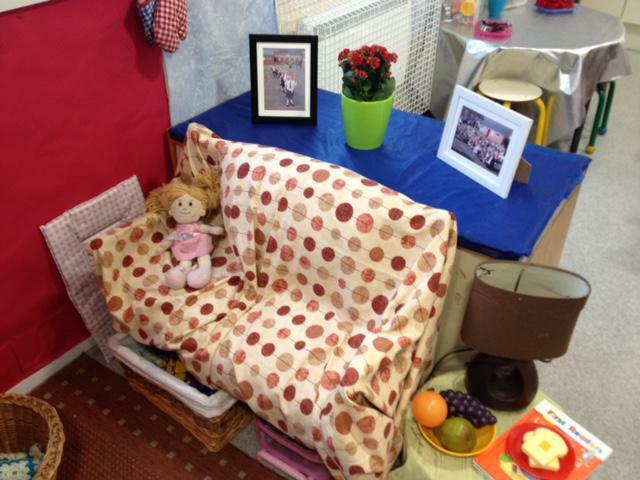 We sat beautifully with all of the classes in Little Gonerby to practise our Harvest Festival. 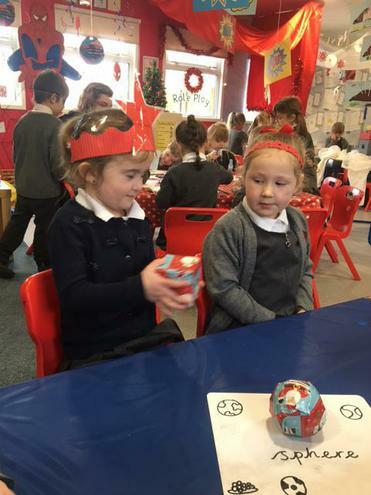 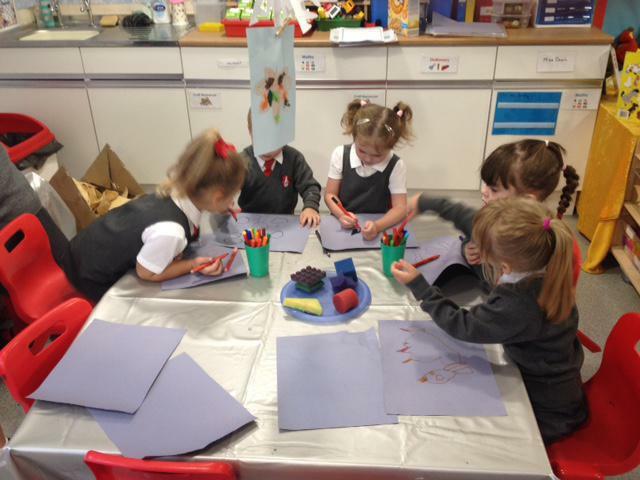 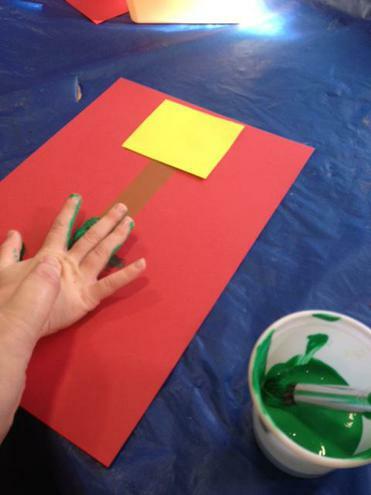 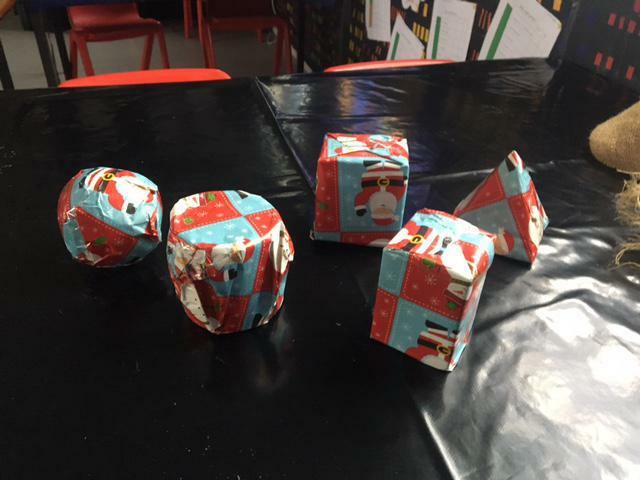 We have been making our Christmas cards using 2D shapes and hand prints! 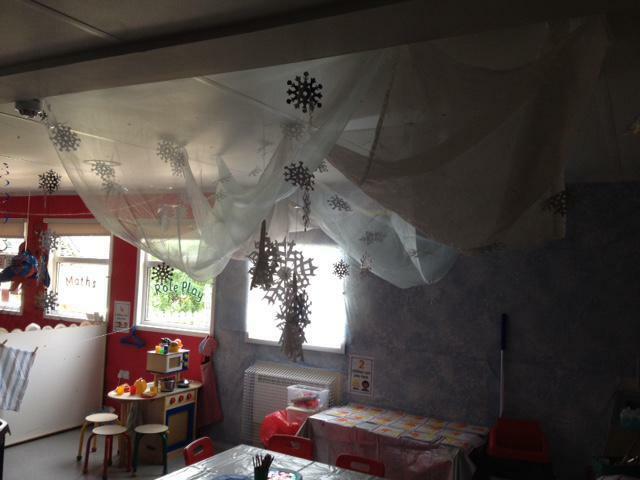 We added sparkly details once they were all dry. 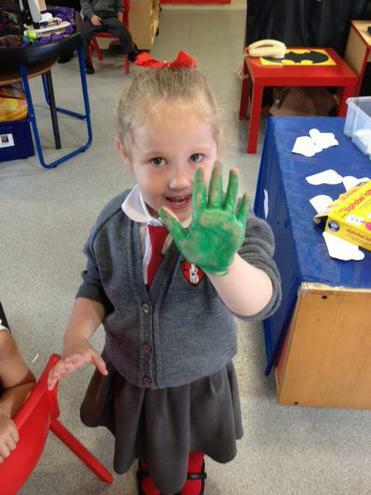 Once we had finished, we practised our hand washing skills from last week, to make sure all the paint was gone and our hands were clean. 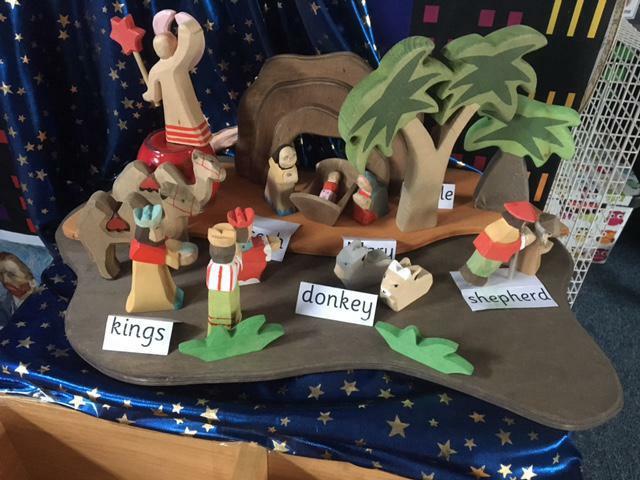 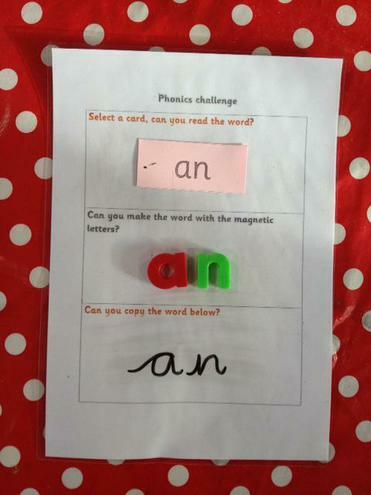 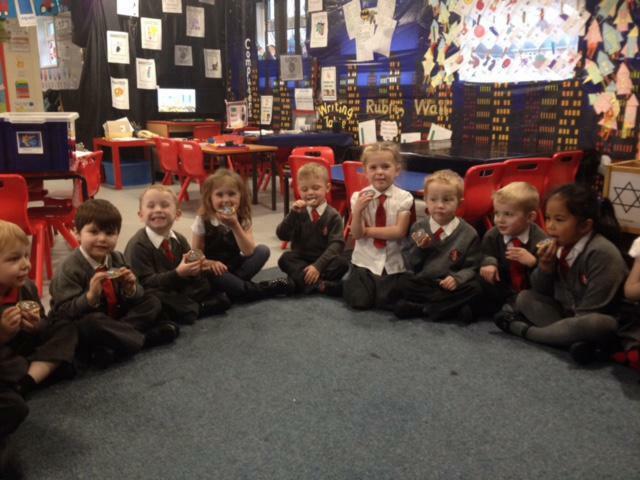 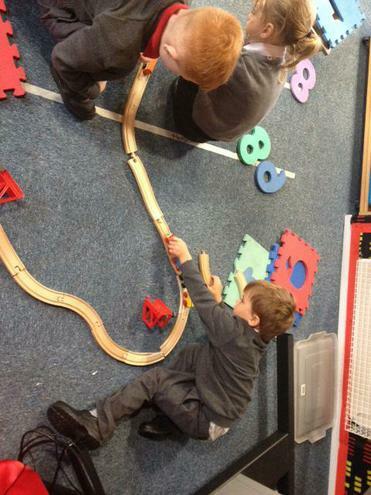 Our teachers were very proud of us as we did this very sensibly and independently. 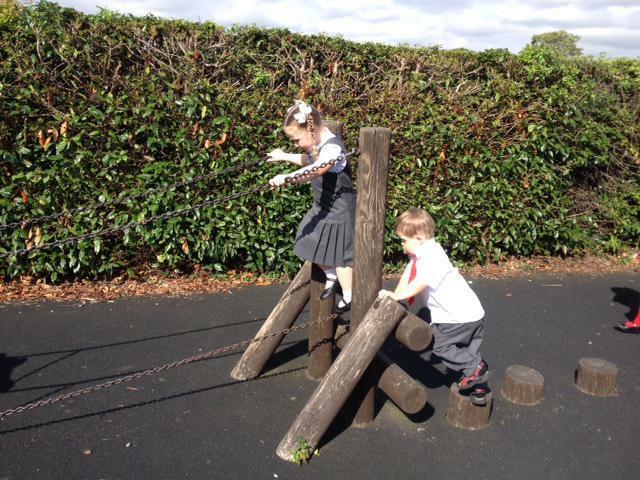 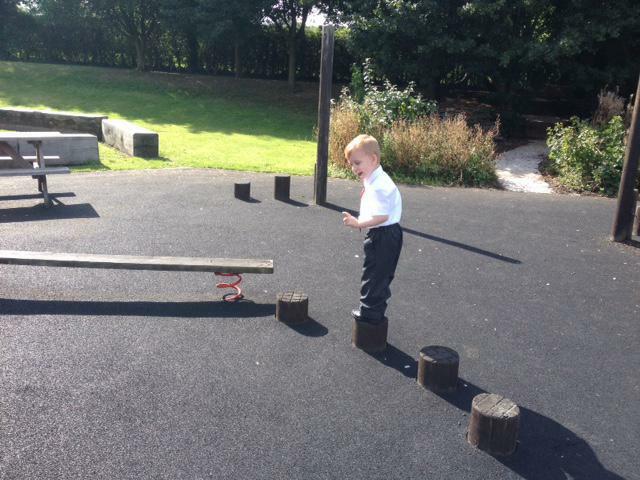 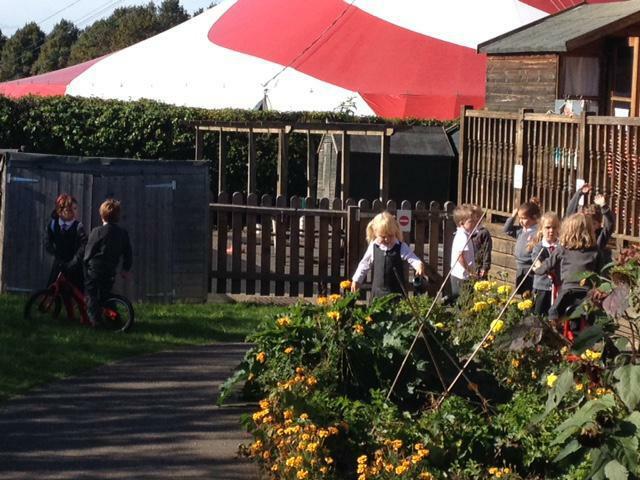 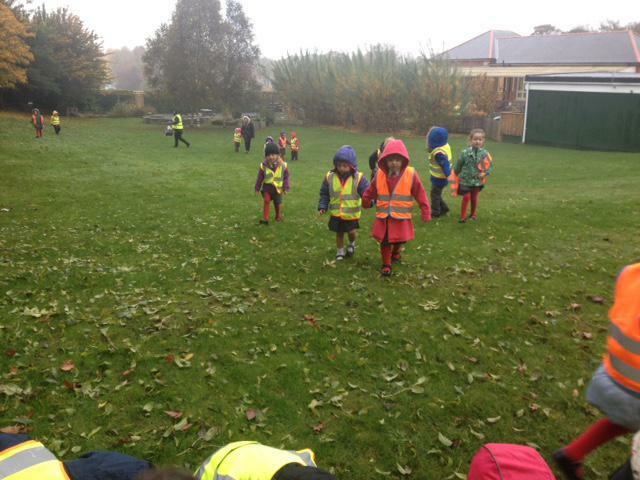 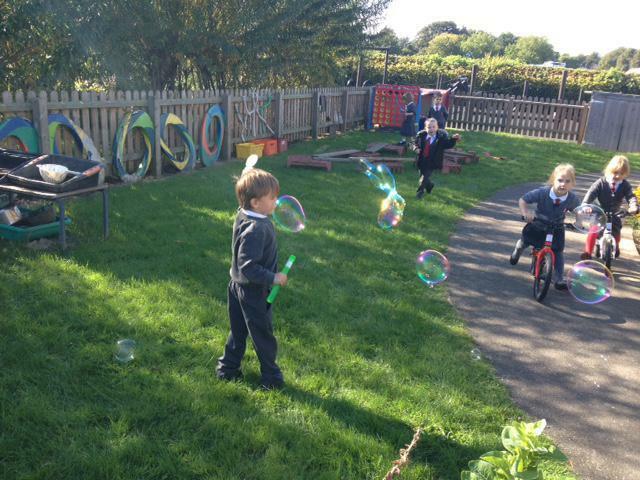 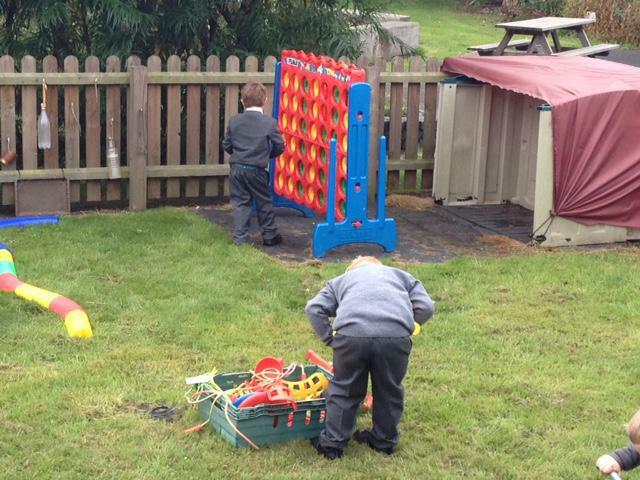 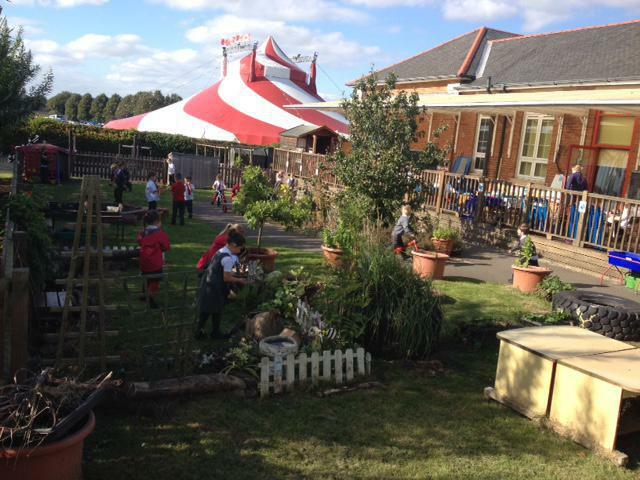 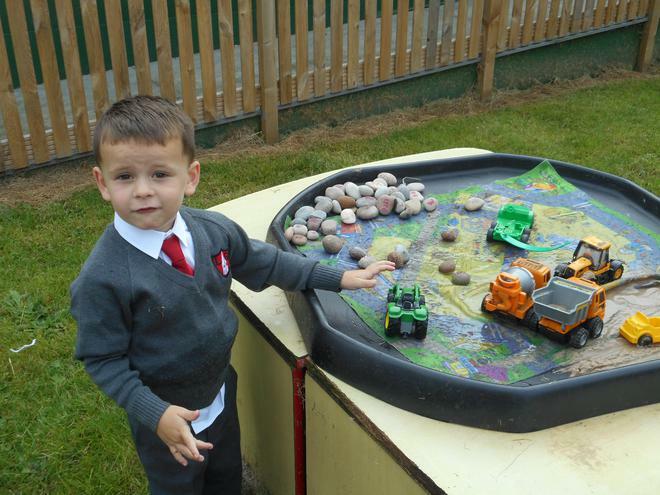 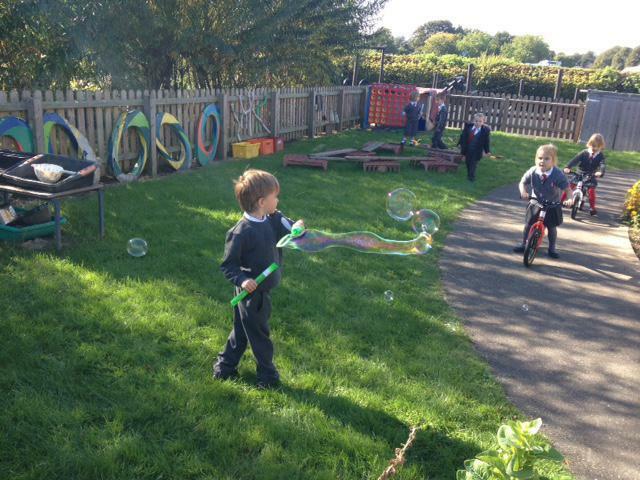 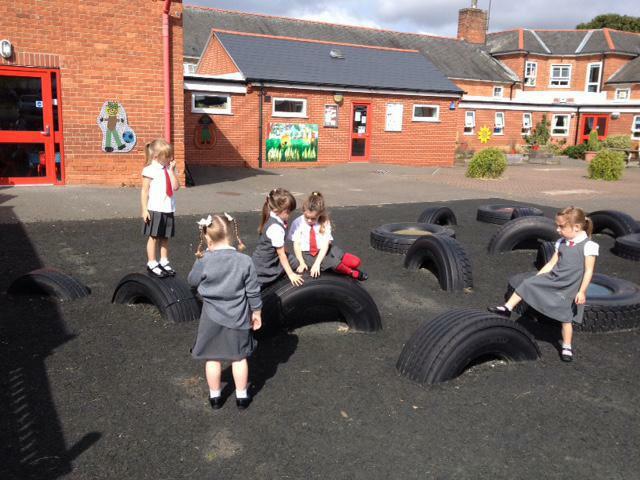 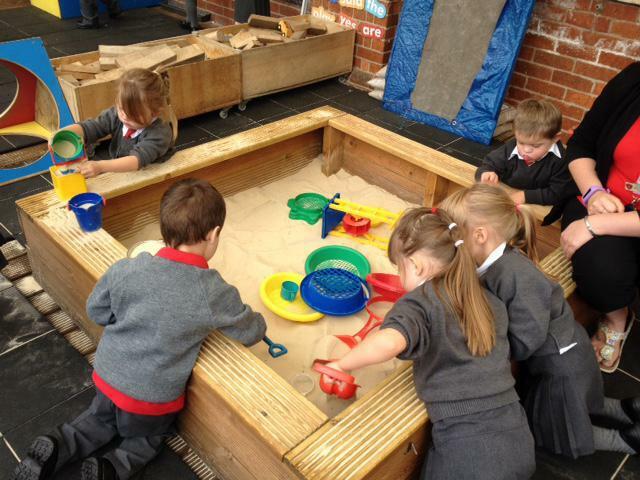 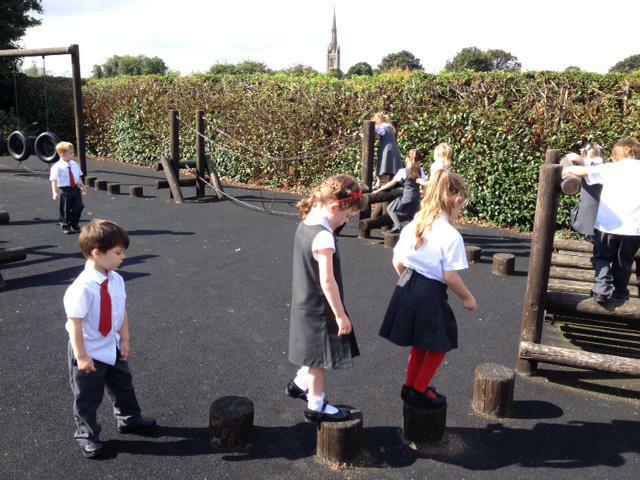 We love exploring all the different activities - inside and outside! 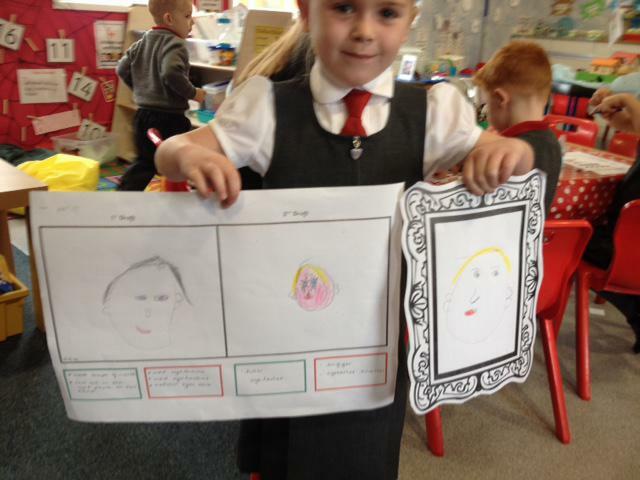 We have been learning all about Portraits and Self Portraits. 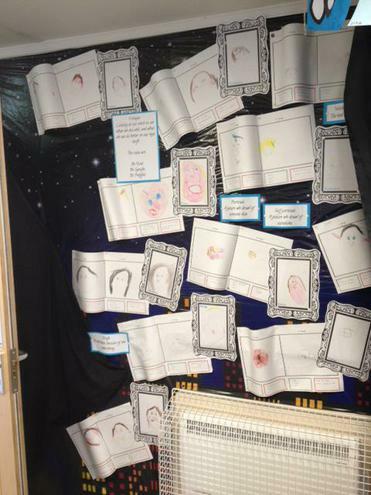 We now know that a portrait is a picture of a person, and that a self-portrait is when make a picture of ourselves. 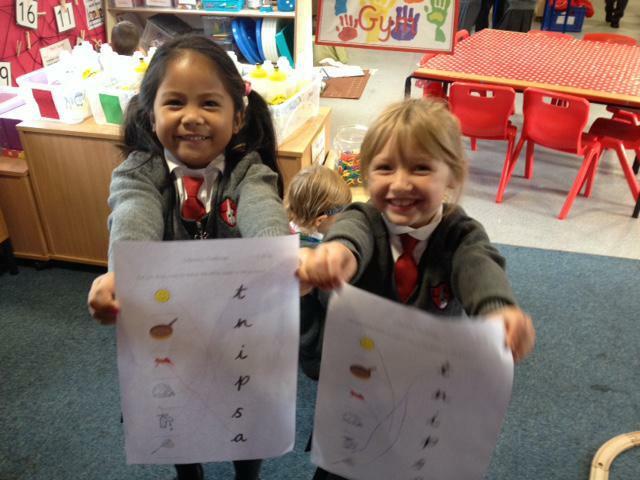 In our groups we made a Rubric. 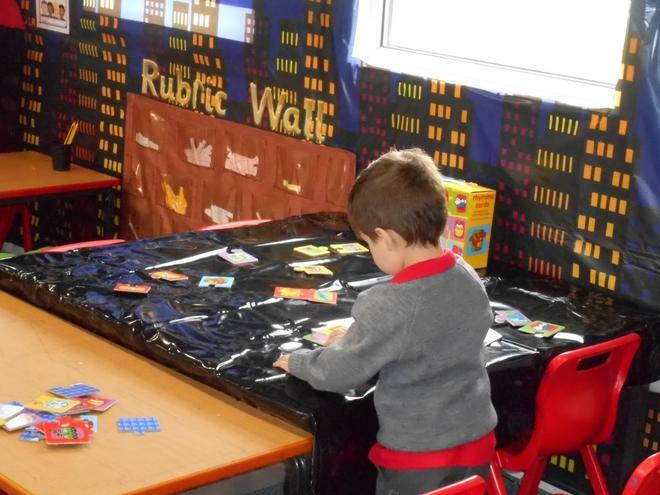 A Rubric is a list of essential things that we must include when we make something, to make sure it's the best it can be. 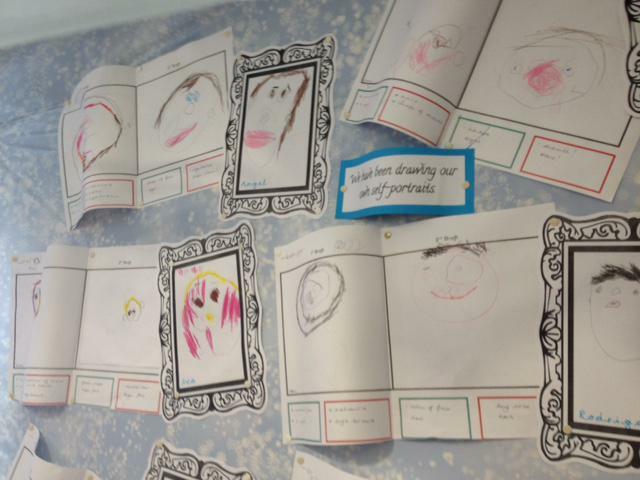 We can make Rubrics for all sorts of things, but we made ours for 'drawing a great face'. 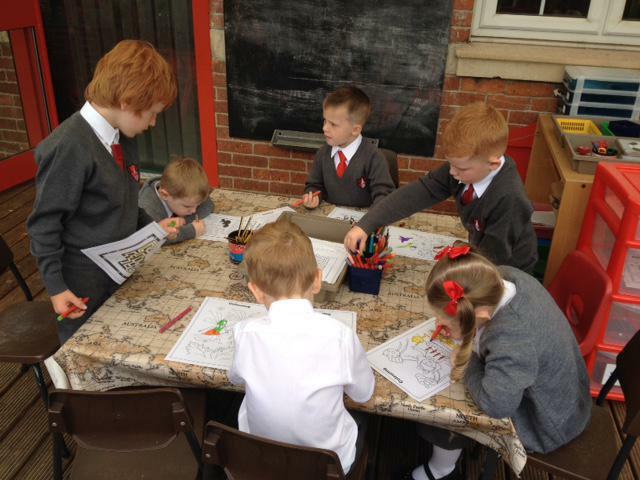 We enjoyed looking at work by famous artists such as Warhol, Klimt, Van Gogh and Da Vinci. 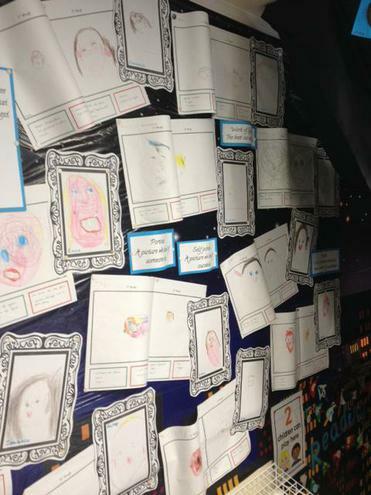 We used them to decide what we must have to make a great, realistic face, and what other details we could add to make it even better. 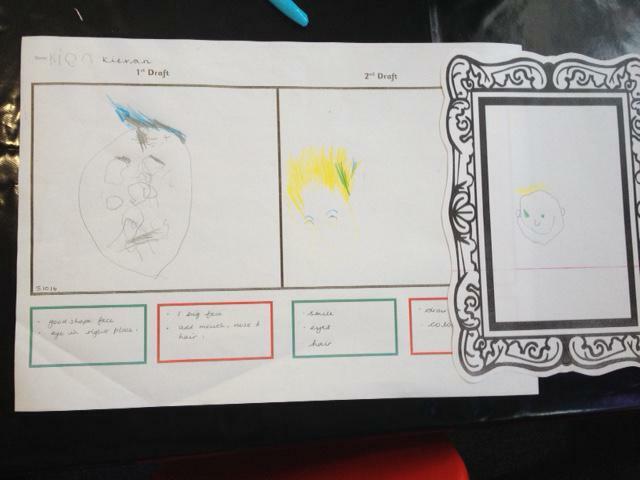 Then the next day we used our Rubric to make our first draft of our own self-portait. 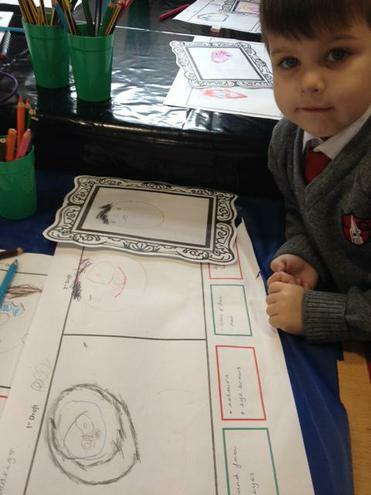 We looked in mirrors to look at shapes and colours, and the Rubric really helped us to think of the details we need to draw a realistic face. 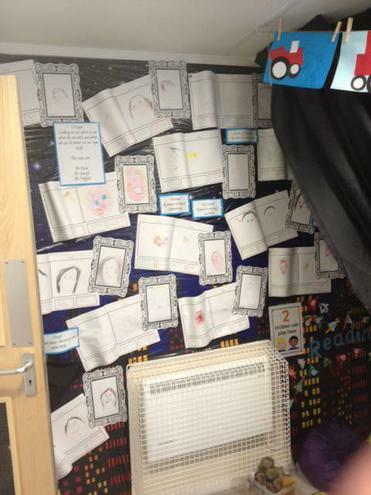 Then we used our critique to give warm feedback, and used our Rubric to think about we would improve in our final drafts. 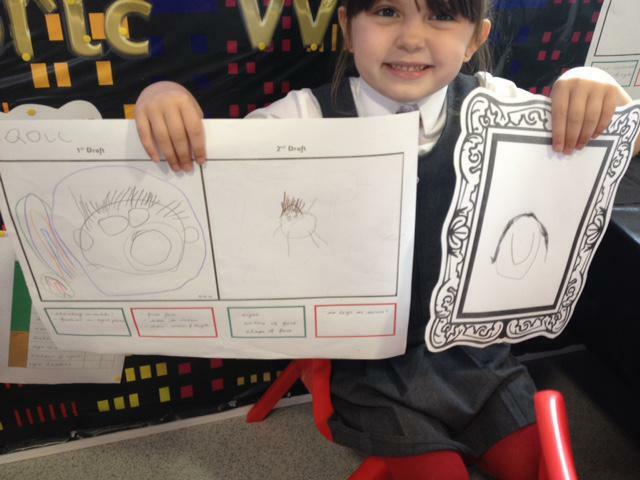 Can you see how our Rubric, drafting and critique has helped us to create some fantastic self-portraits? 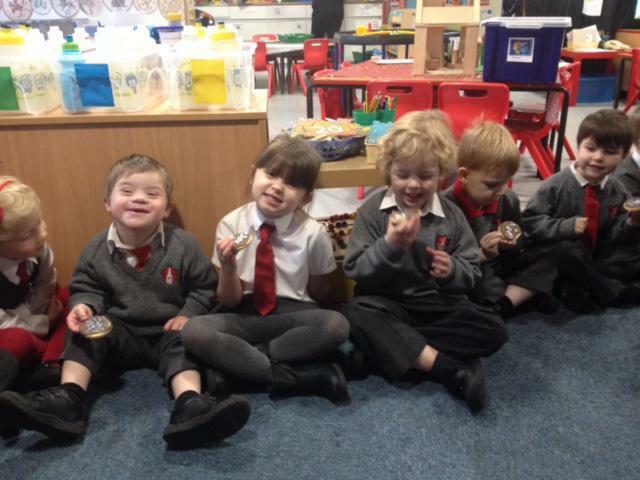 We're so proud of them - as are our teachers. 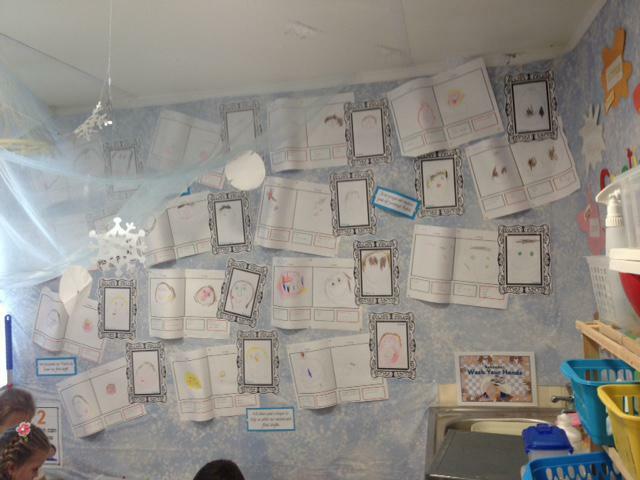 We have made our own gallery in our classroom - look at the difference between our first and final drafts. 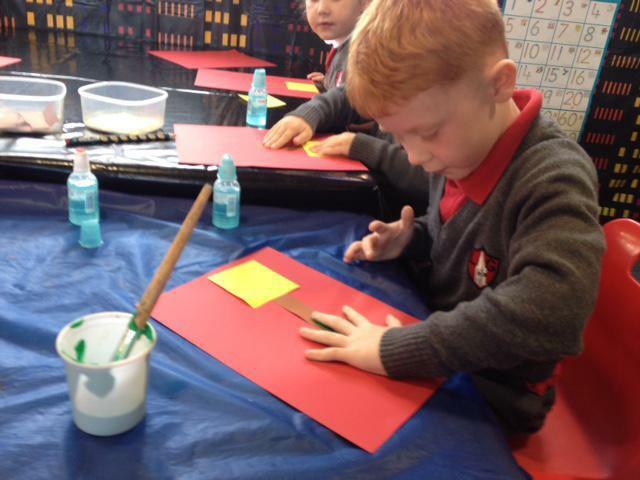 We are artists! 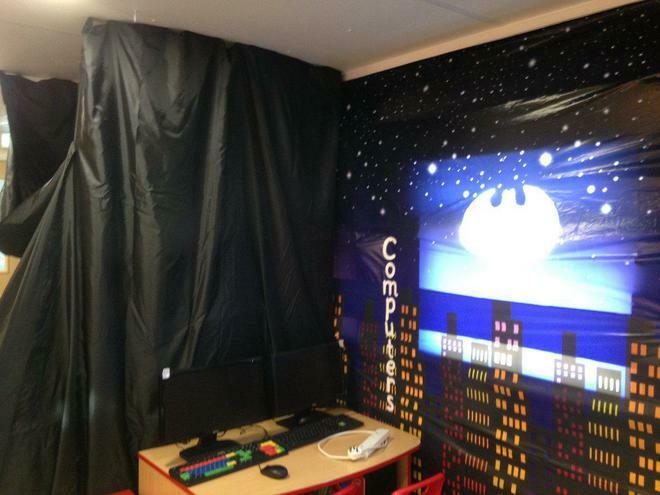 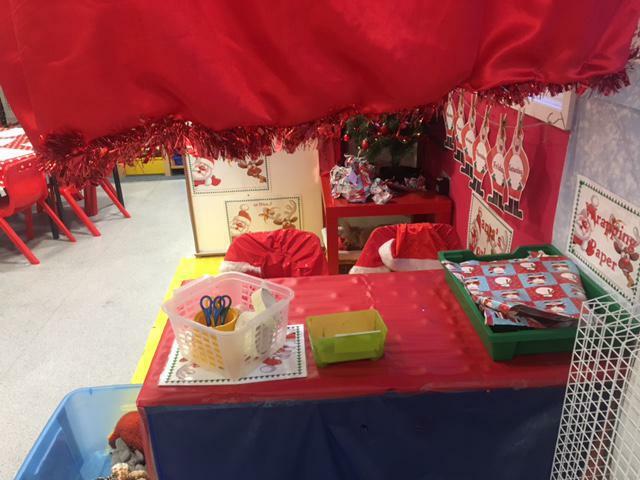 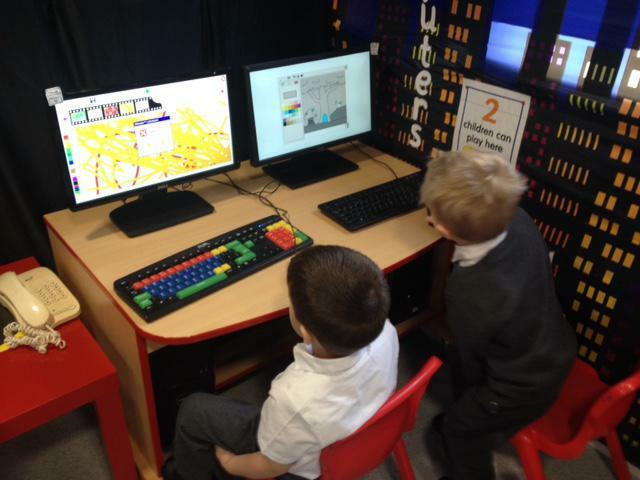 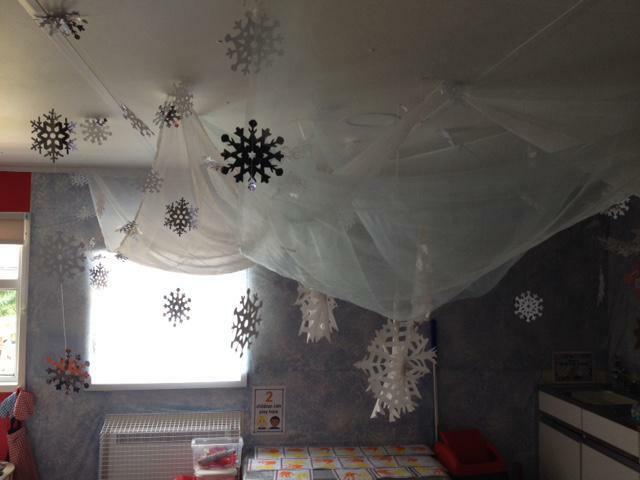 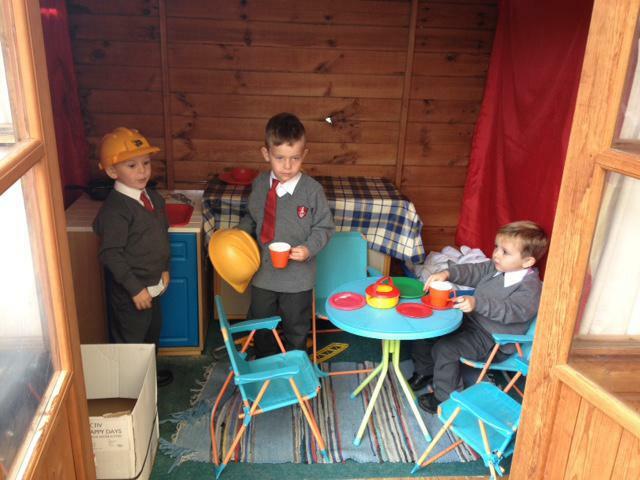 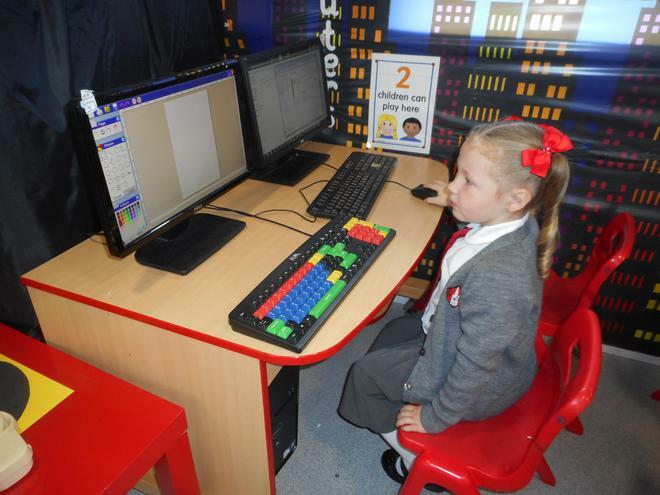 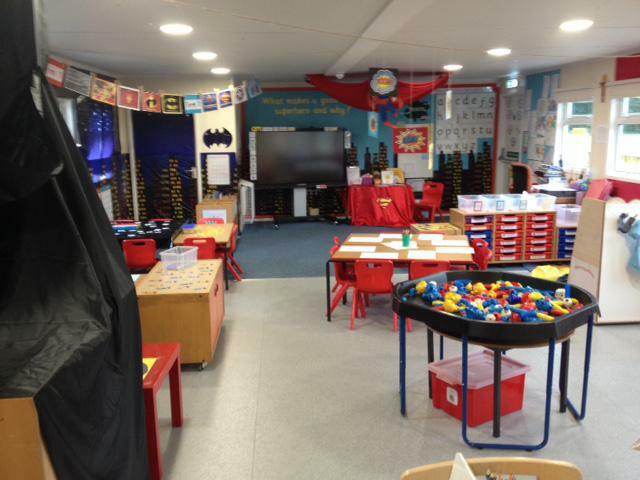 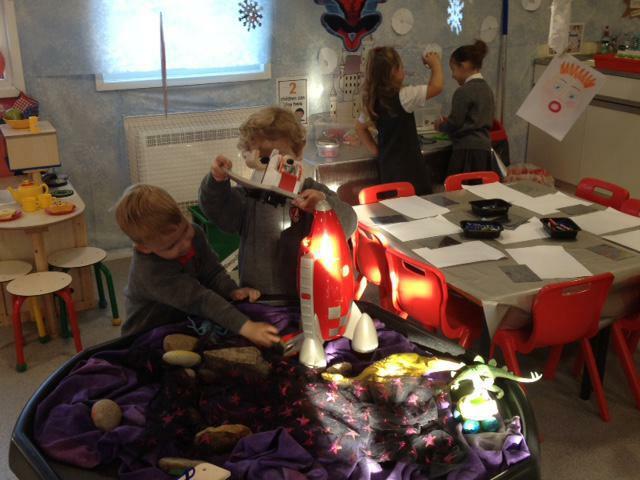 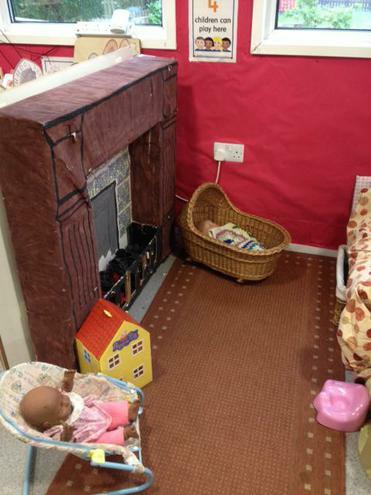 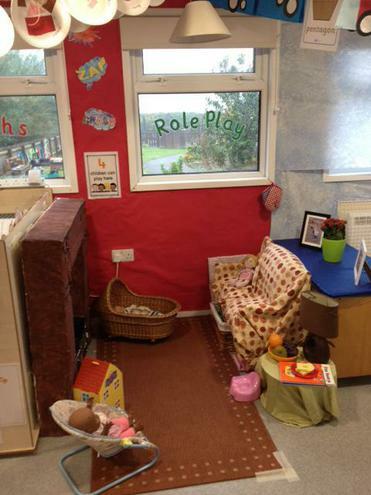 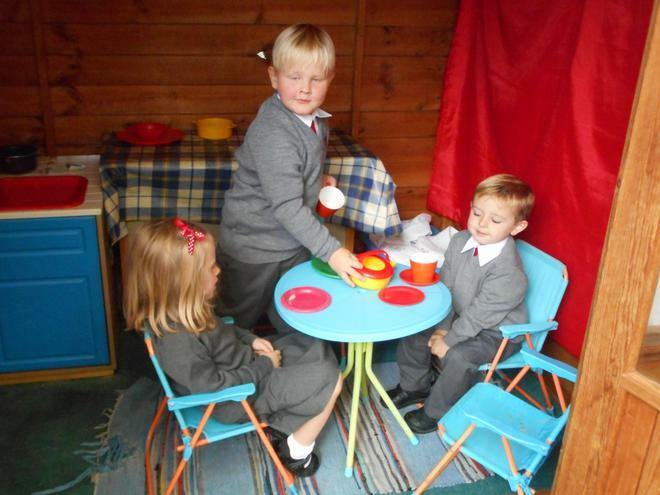 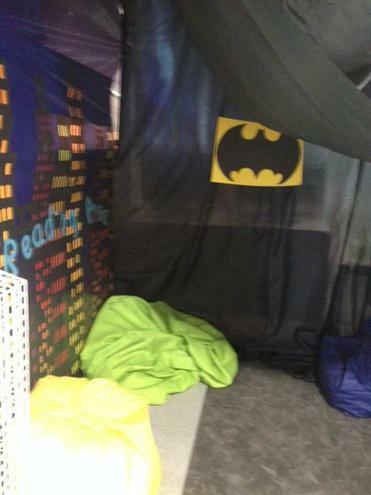 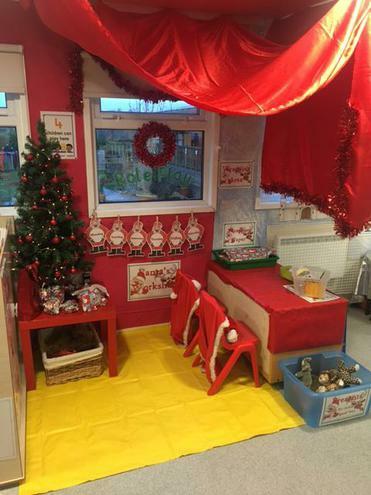 Our fantastic new role play area - we love it! 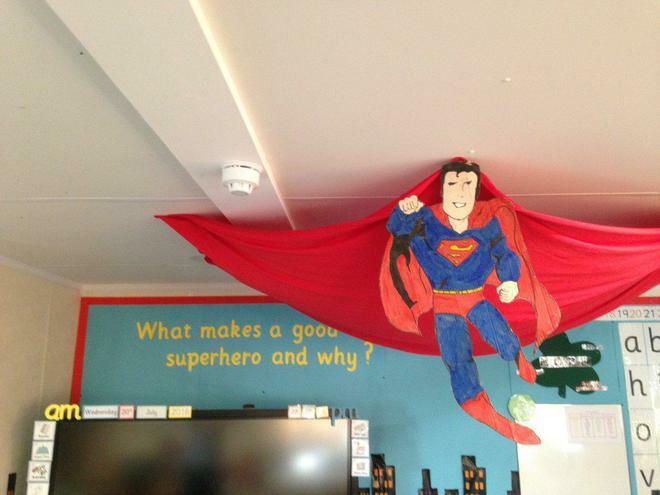 We have been learning about Superheroes, and their 'superhero powers'. 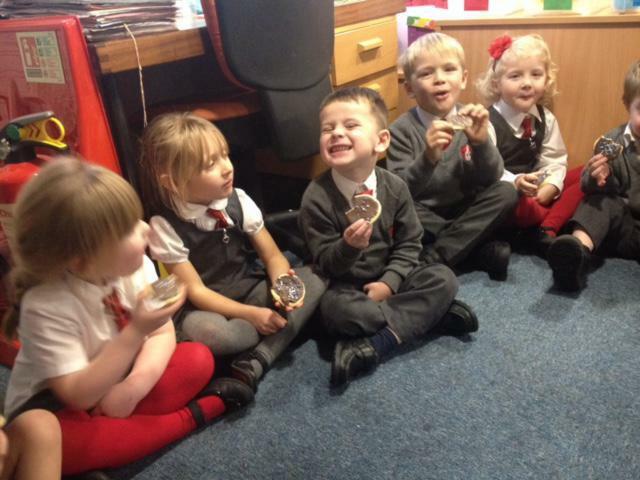 We just loved being read the story of 'Superworm'. 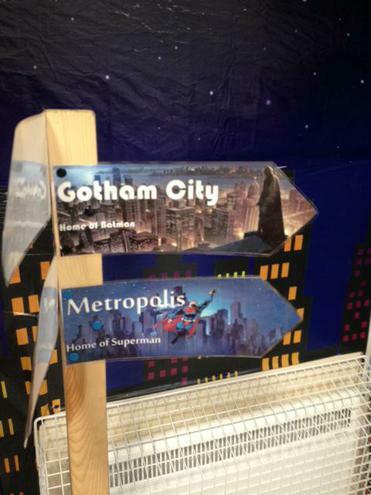 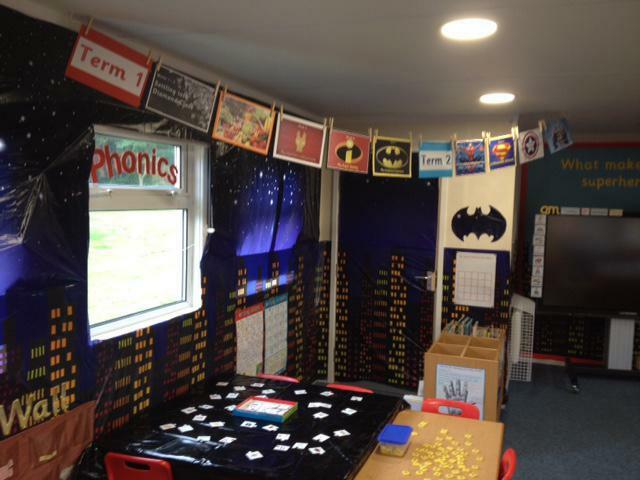 It made us think about how Superheros and superpowers can come in all shapes and sizes. 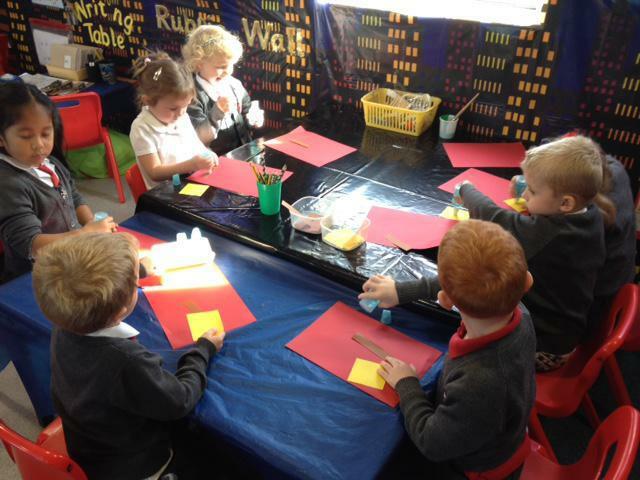 We have been reading superhero stories, making superheros using lollypop sticks, designing our own superheros, making superhero identity badges. 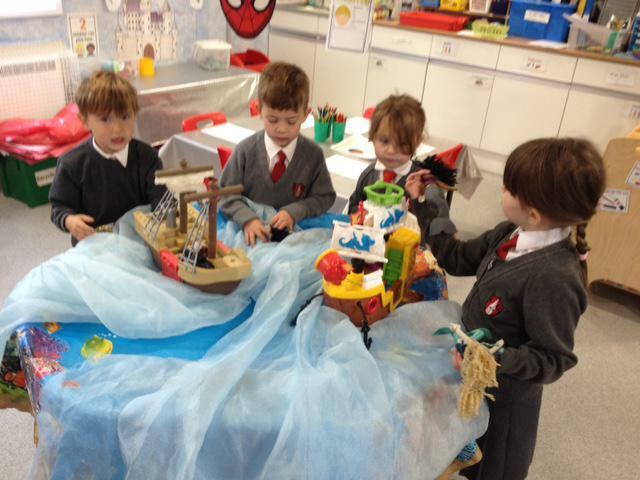 We have such great imaginations! 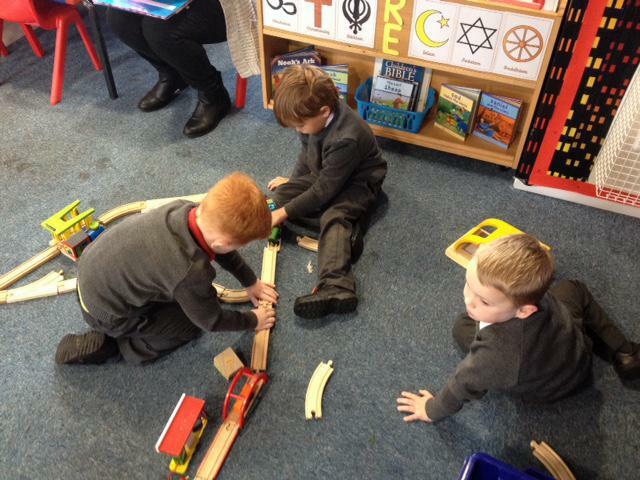 We love acting and making our own stories. 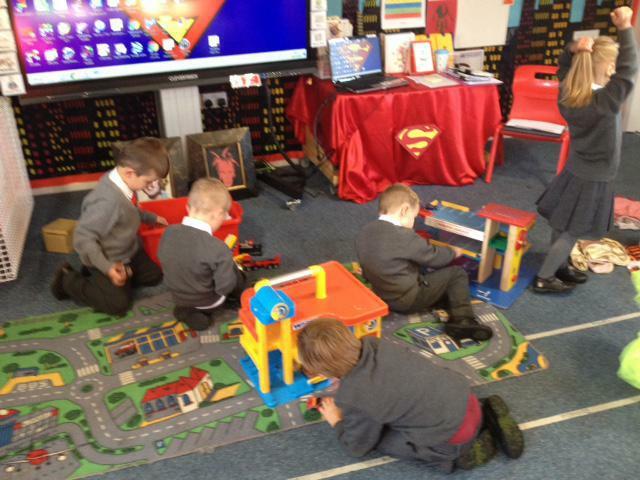 We are being 'superhero' Police Officers. 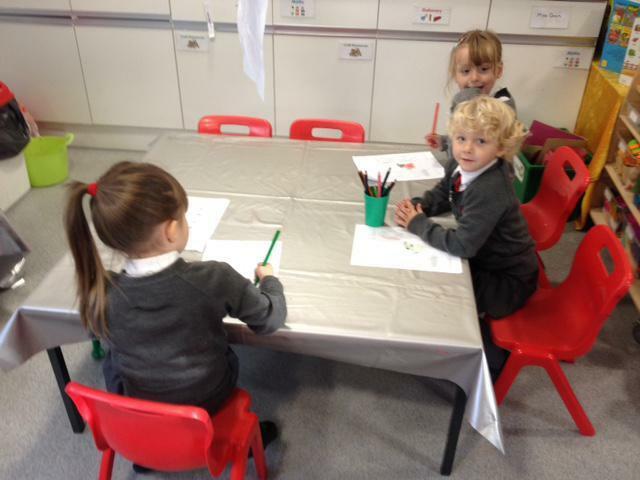 Just look at our faces to see how well we are acting out our different characters! 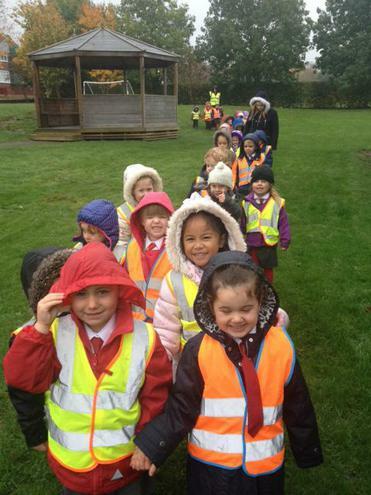 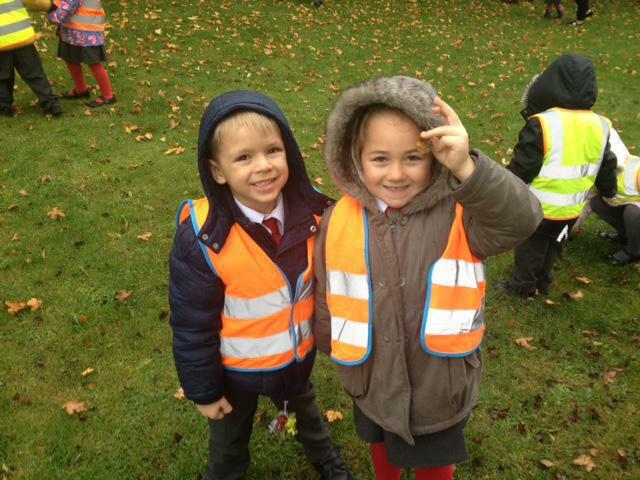 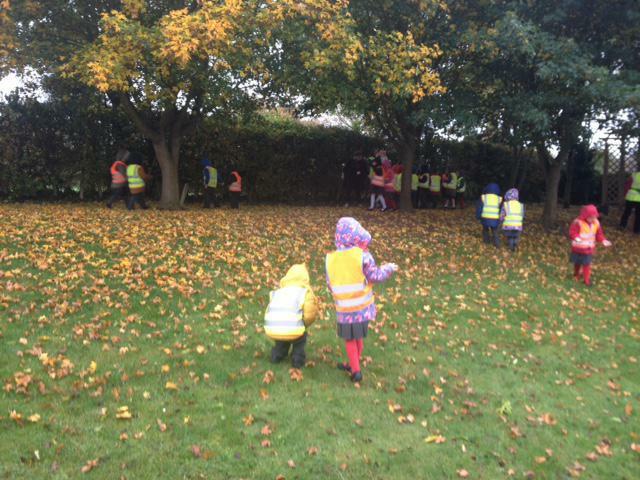 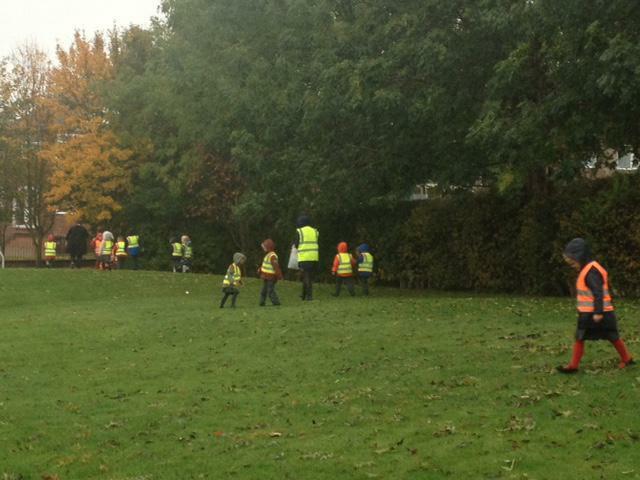 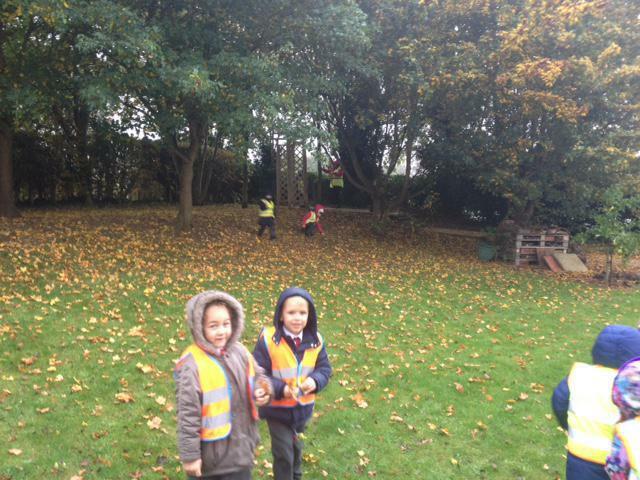 We have enjoyed an autumn walk around school with Sapphire Class, searching for and collecting leaves of different sizes, colours and shapes. 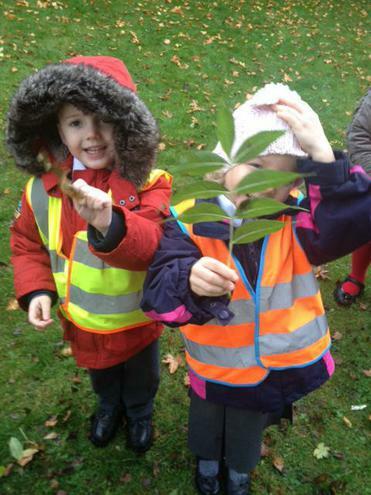 We put the leaves in our class tuft spot so we could examine them using our senses of sight, touch and smell. 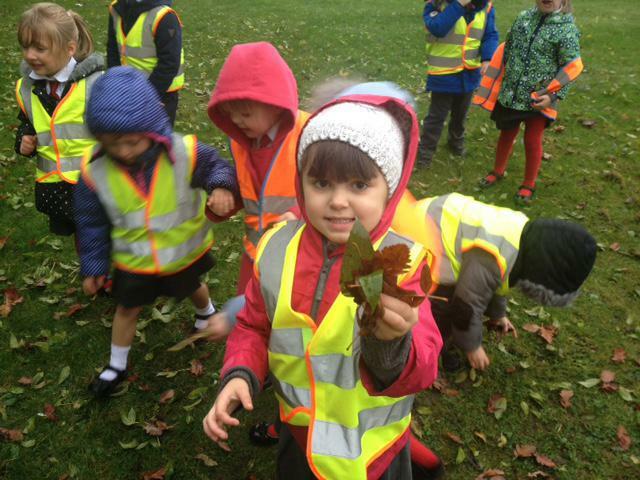 We were challenged to find a small, medium and large sized leaf with our partner. 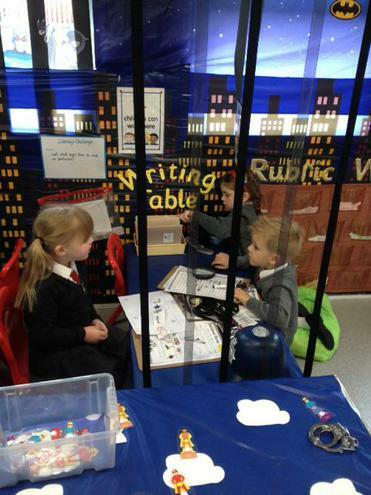 Our superhero school role play and writing table has been such fun! 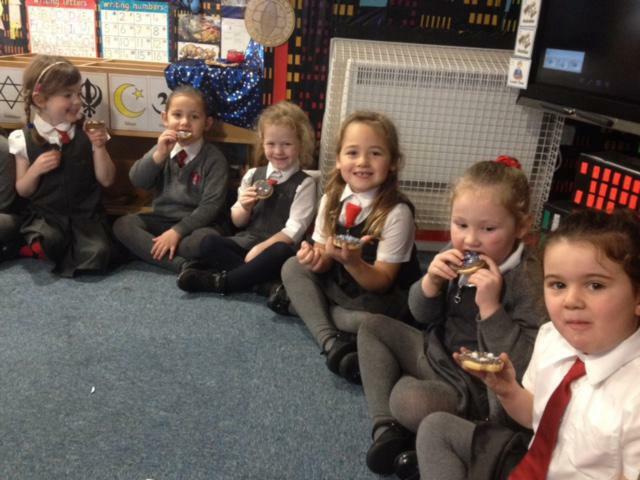 We were invited by Topaz Class to watch their wonderful dance. 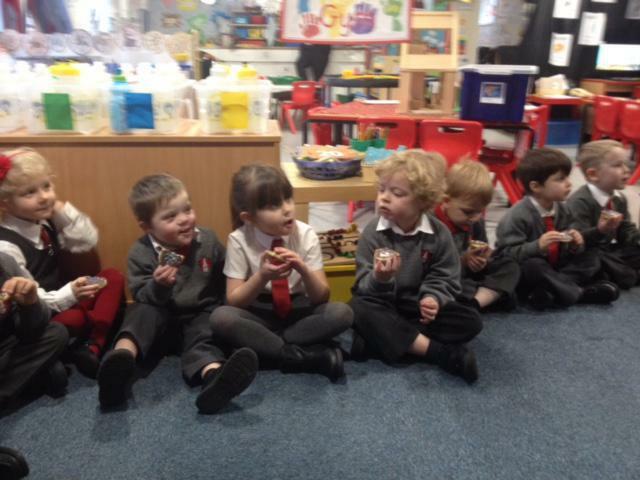 We were entranced! 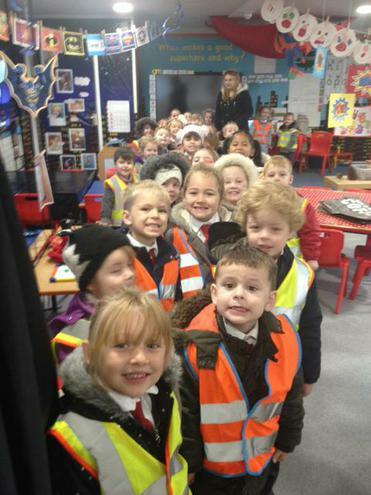 And our teachers thought we were a great audience as we sat so brilliantly! 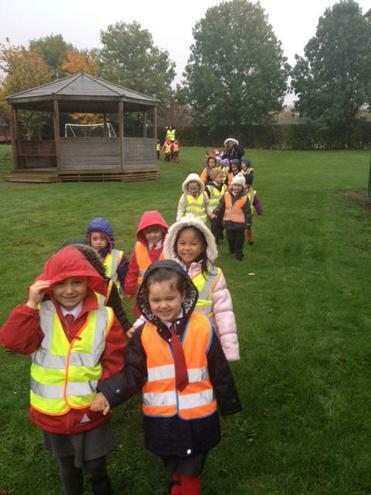 As part of Road Safety Week our local PCSO's came to teach us how to cross the road safely. 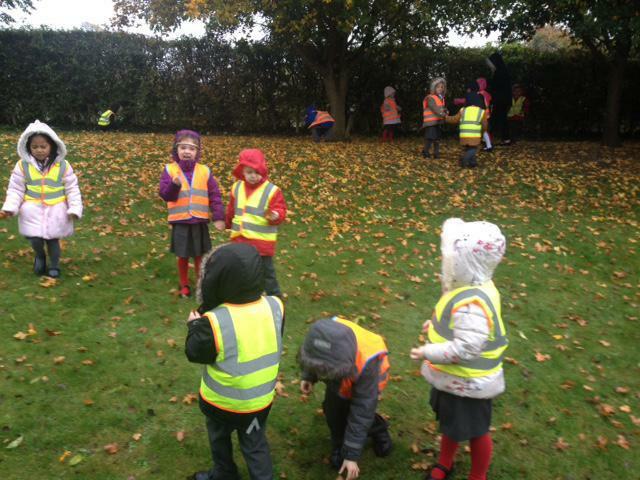 We had to STOP, LOOK and LISTEN, and then LOOK again before crossing the road. 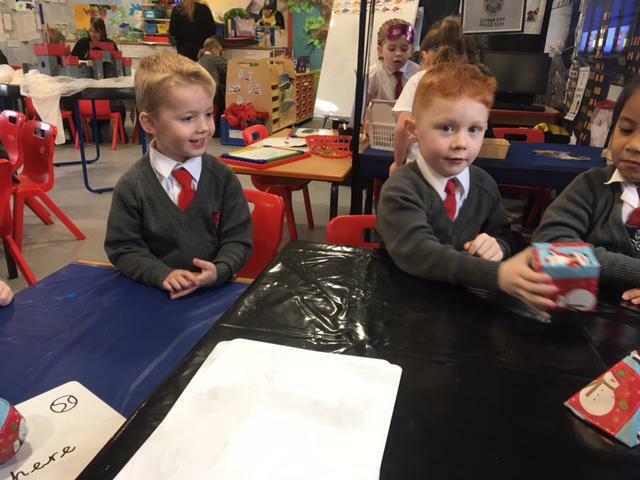 We have been practising our numbers 0-20 - looking closely at each one, ordering them from smallest to largest and then making towers to show each number. 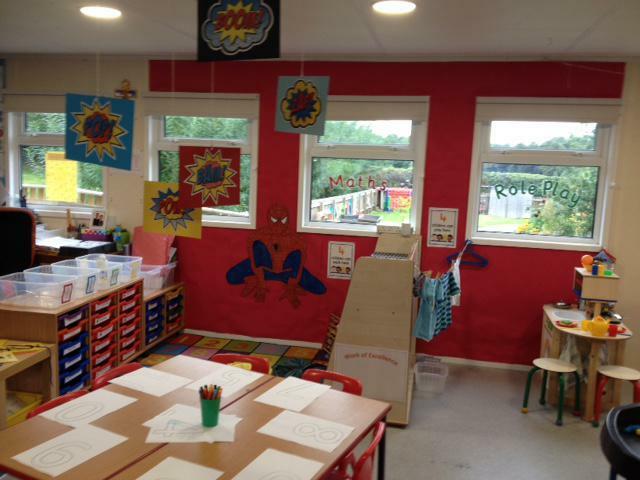 Look how brilliantly we did! 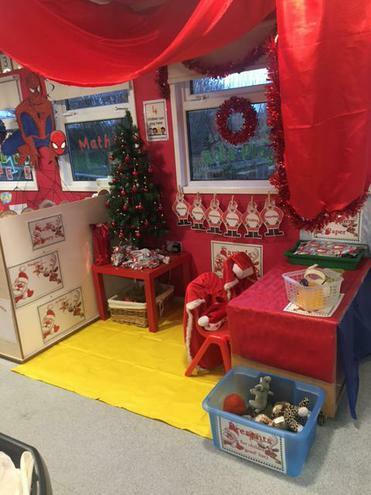 Our teachers are so proud of how well we have settled at school. 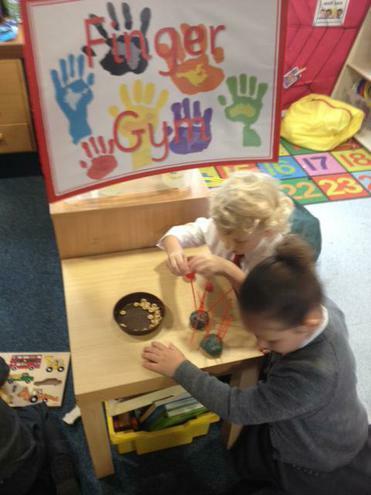 They think we are becoming so independent, and are beginning to work and concentrate really well! 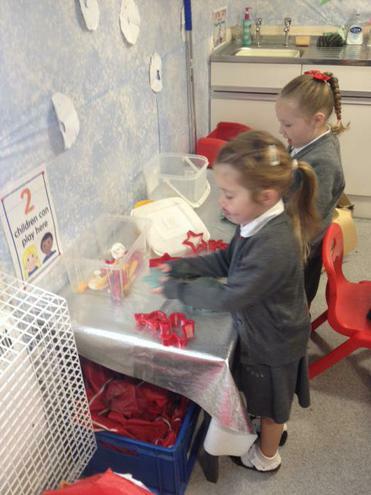 We have been exploring 3D shapes. 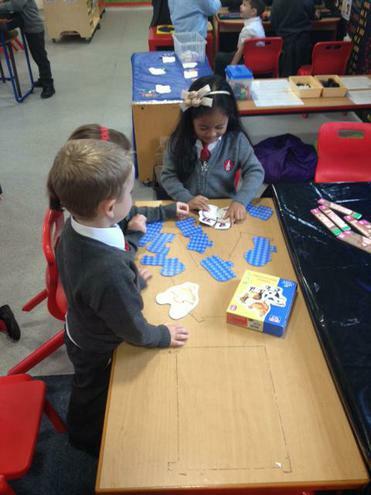 We have been learning to identify the 'faces' of the shapes, using the 2D shapes that we know. 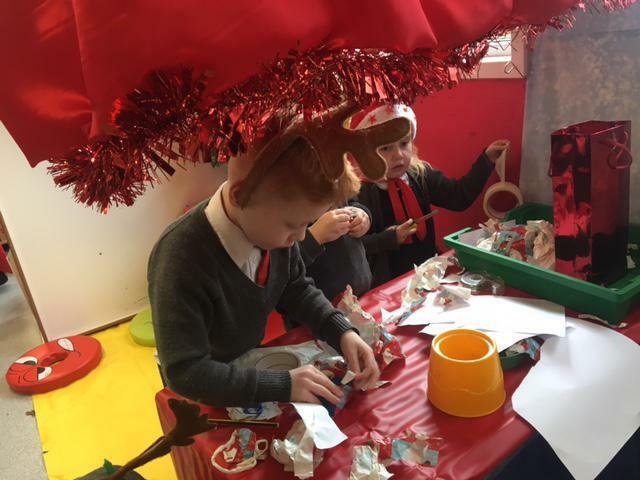 Practising our colouring and cutting skills whilst we make our own Elves! 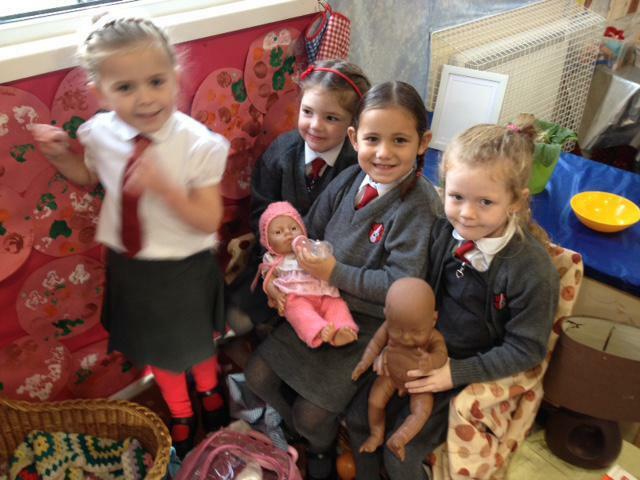 All ready for our dress rehearsal of our Reception production of 'Whoops-a-Daisy Angel'. 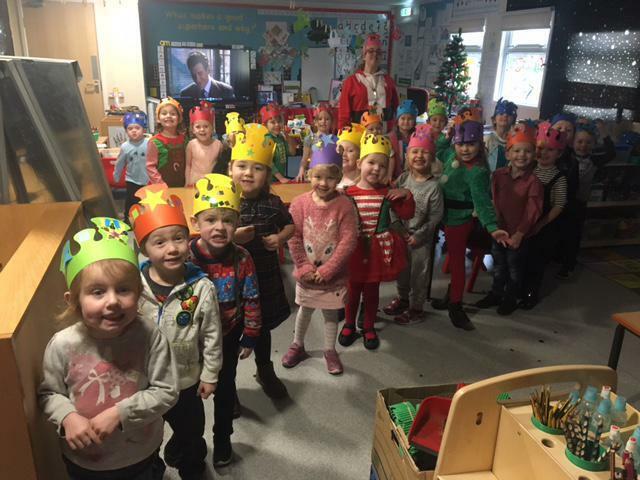 Don't we look fantastic! 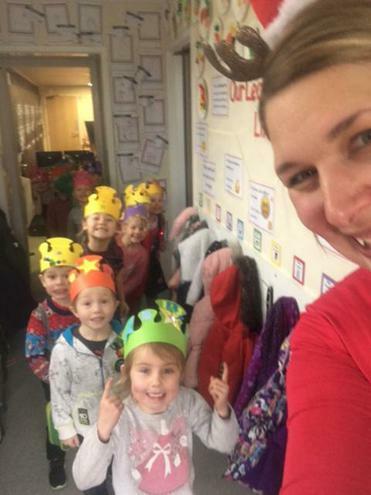 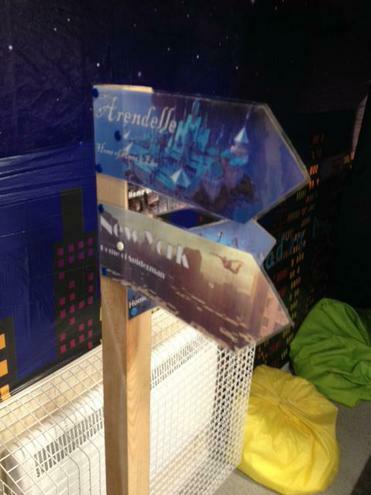 (A BIG thank you from all our teachers for all the brilliant costumes that were sent in from home). 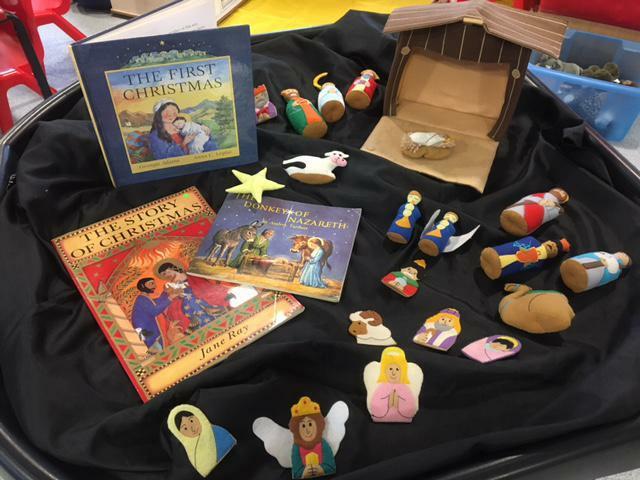 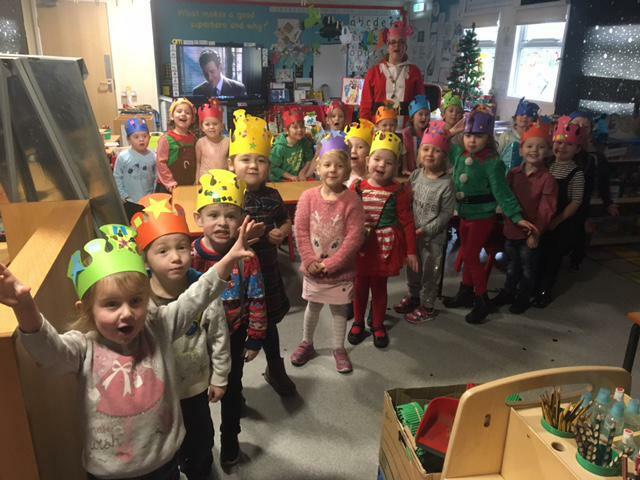 What a wonderful way to end Term 2 and get ready for Christmas! 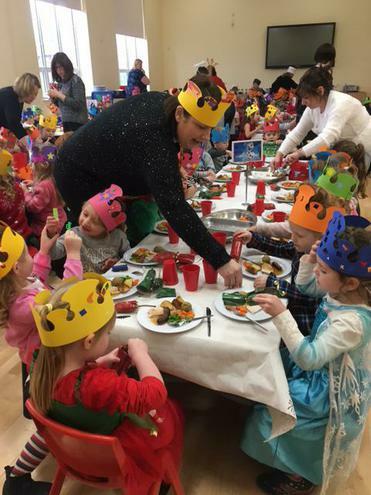 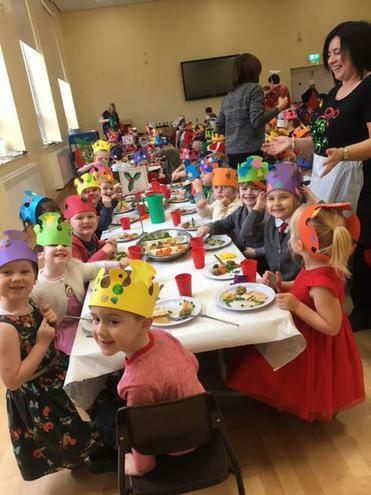 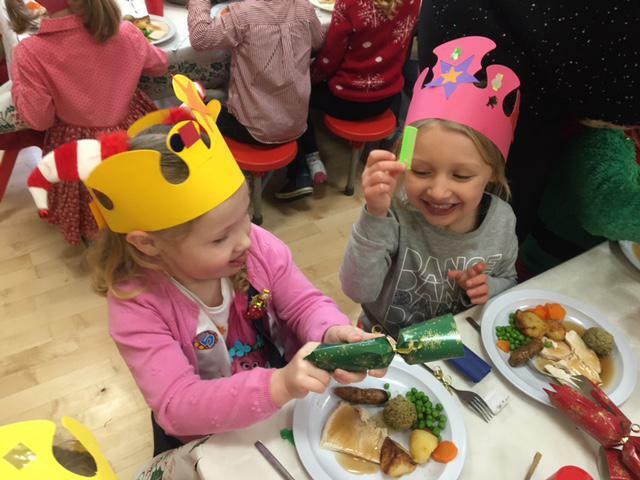 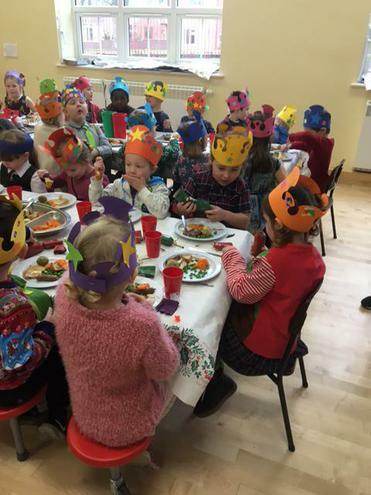 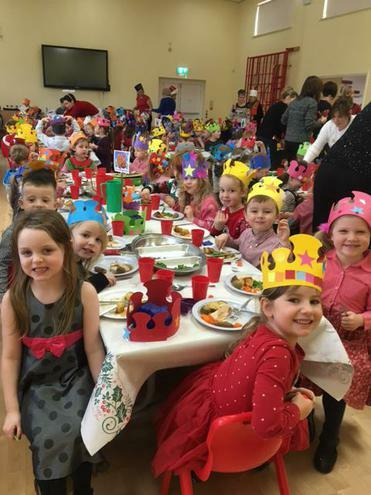 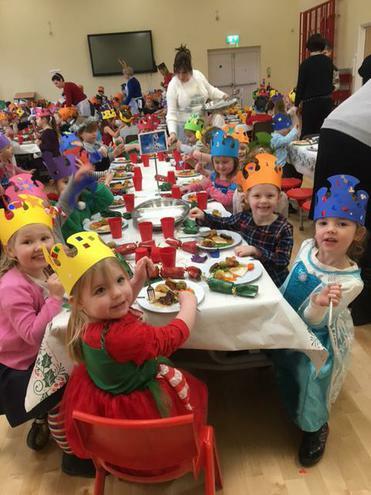 We had a great last week of term, including our delicious whole school Christmas lunch made by Mrs Jones, our chef, and her team.